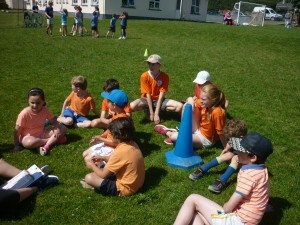 Whistle blown,sun shining and teams ready. 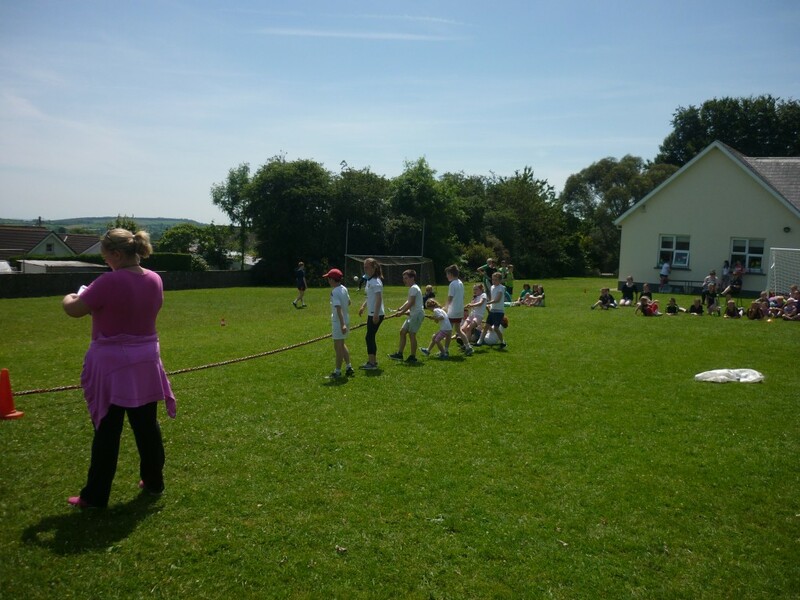 Welcome to our Sports Day. 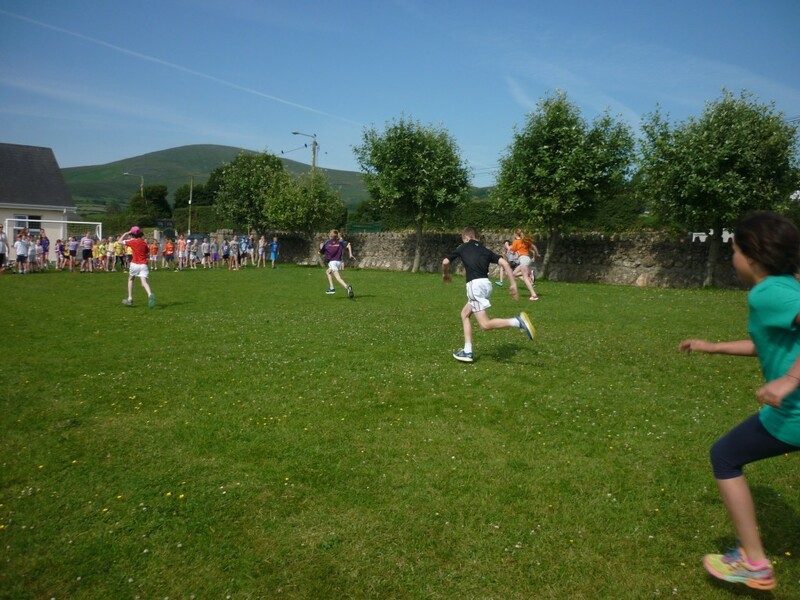 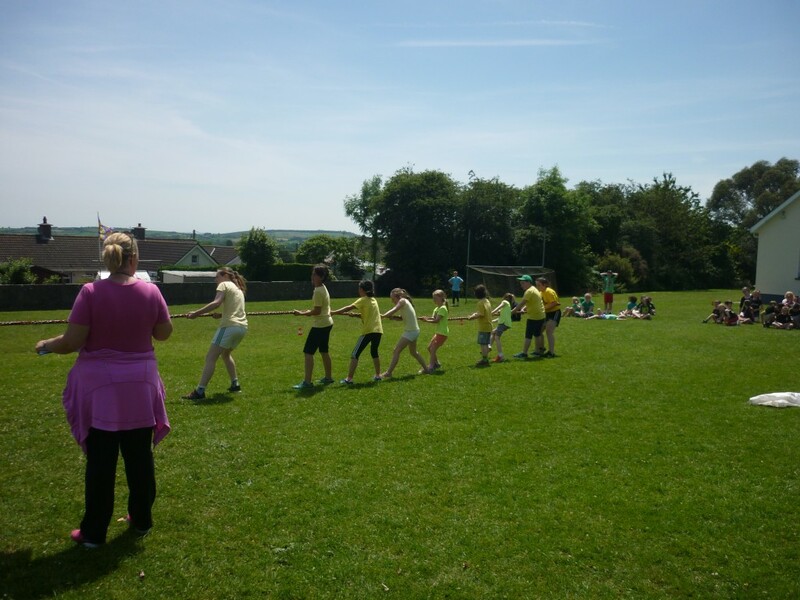 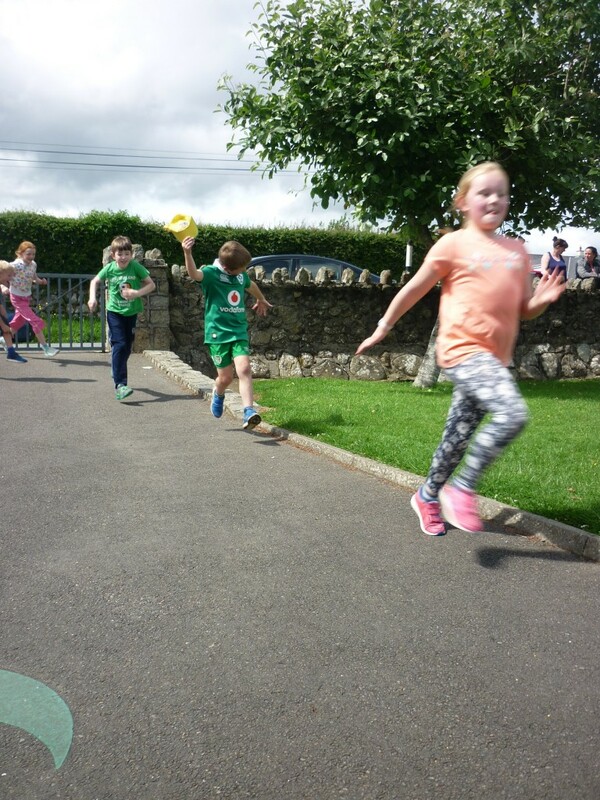 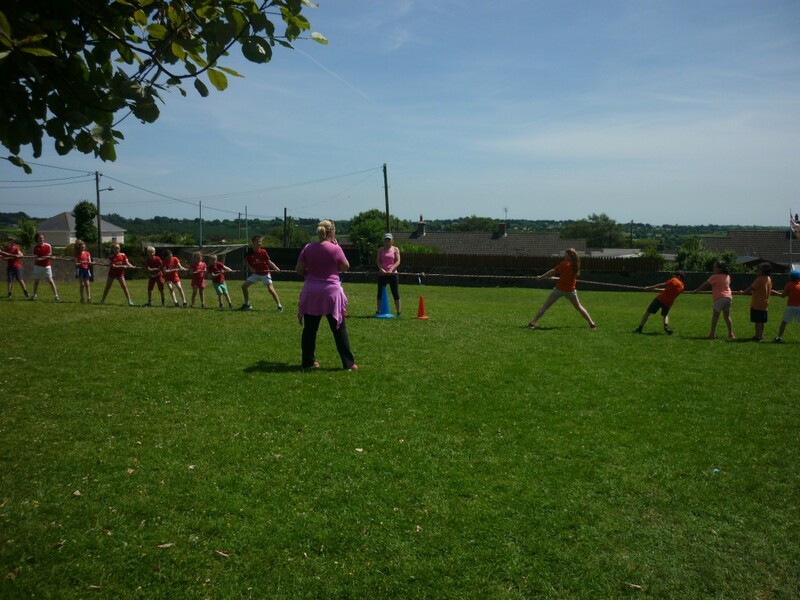 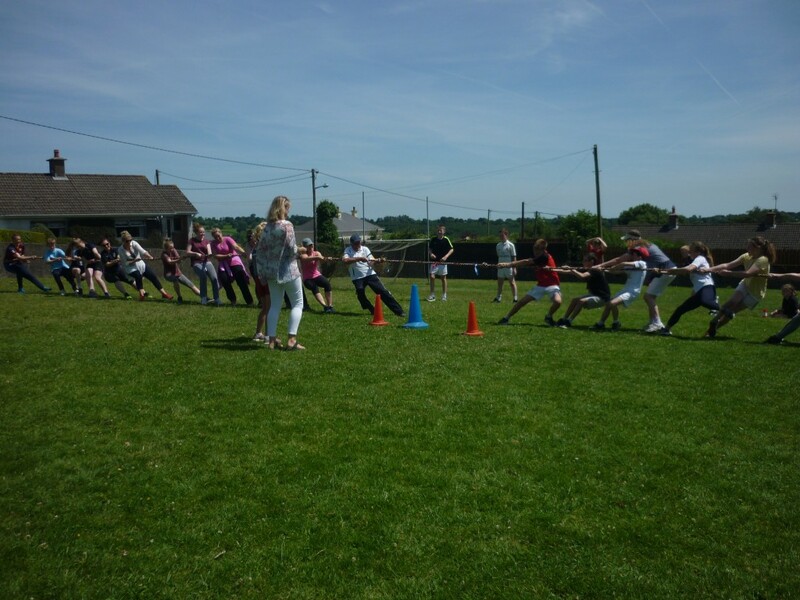 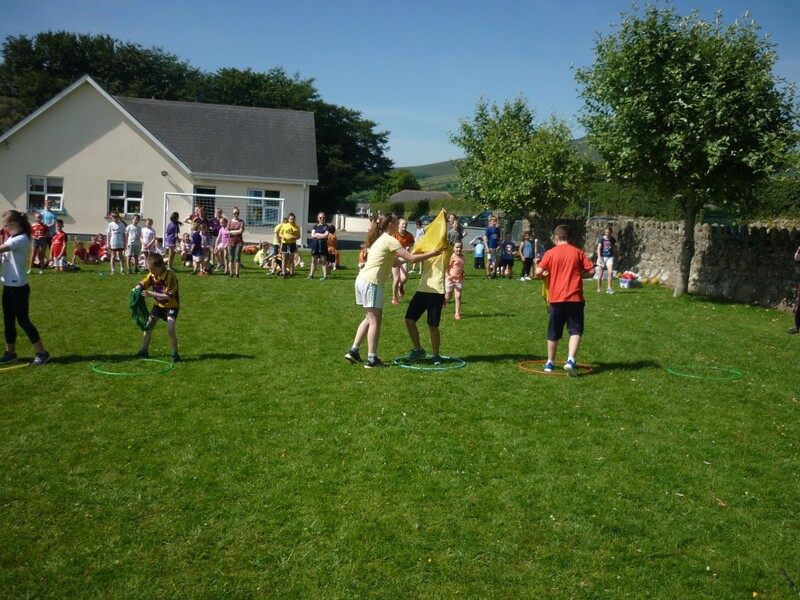 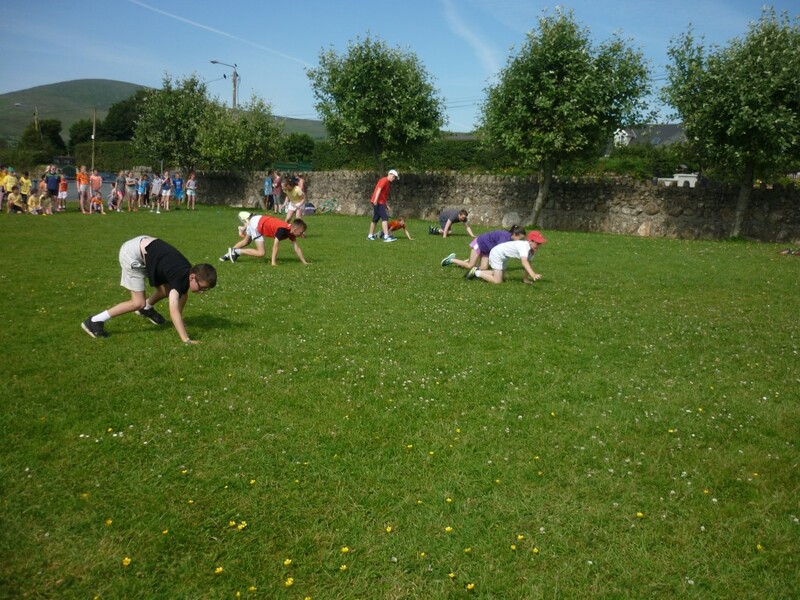 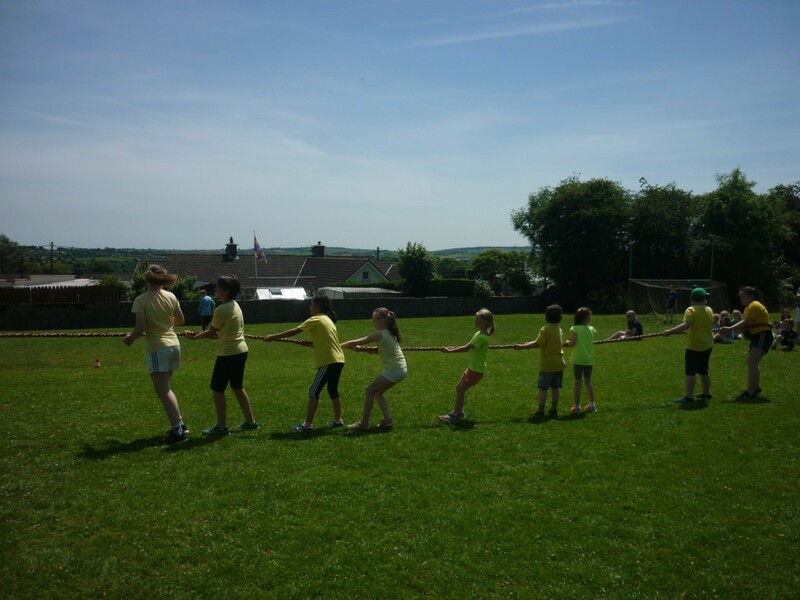 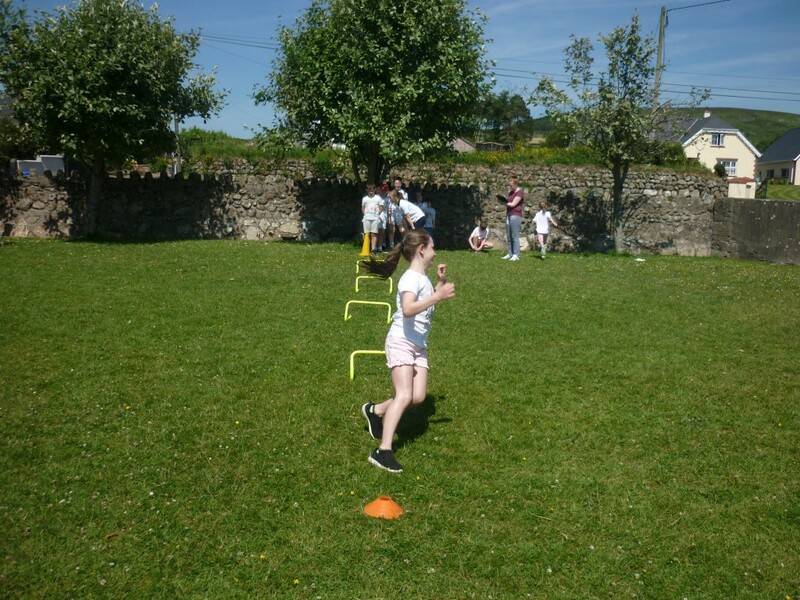 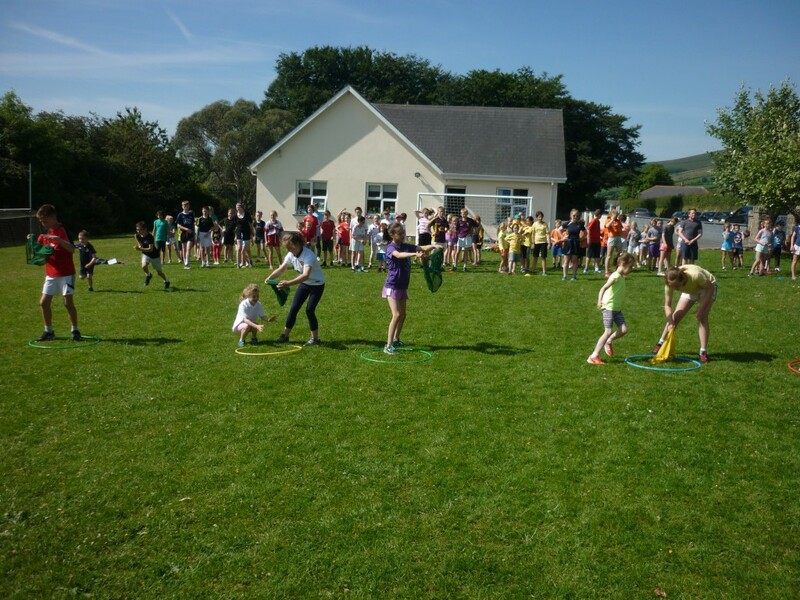 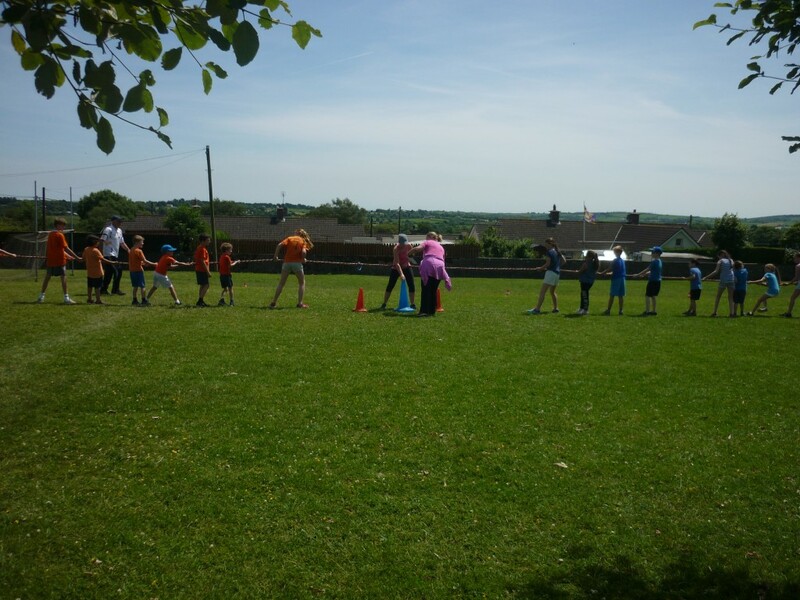 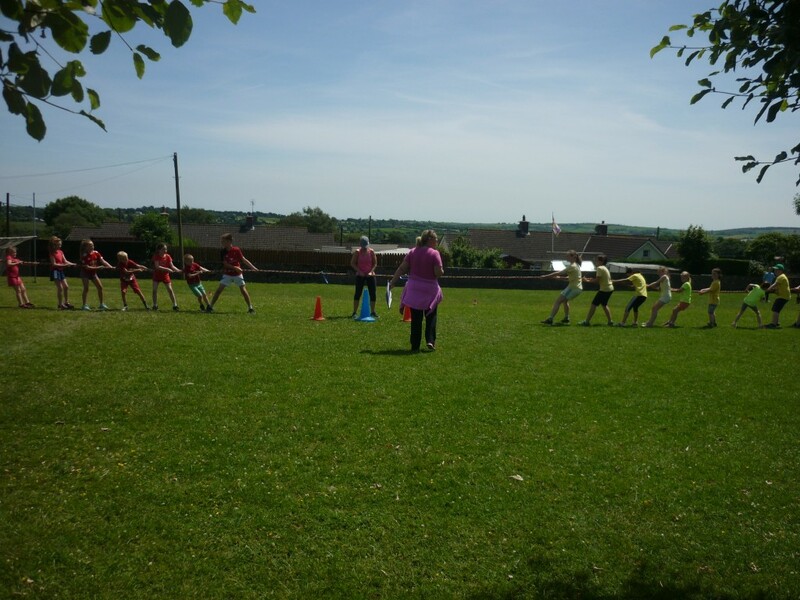 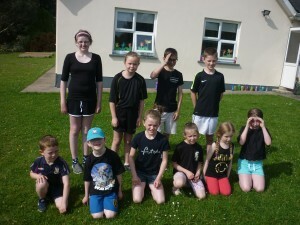 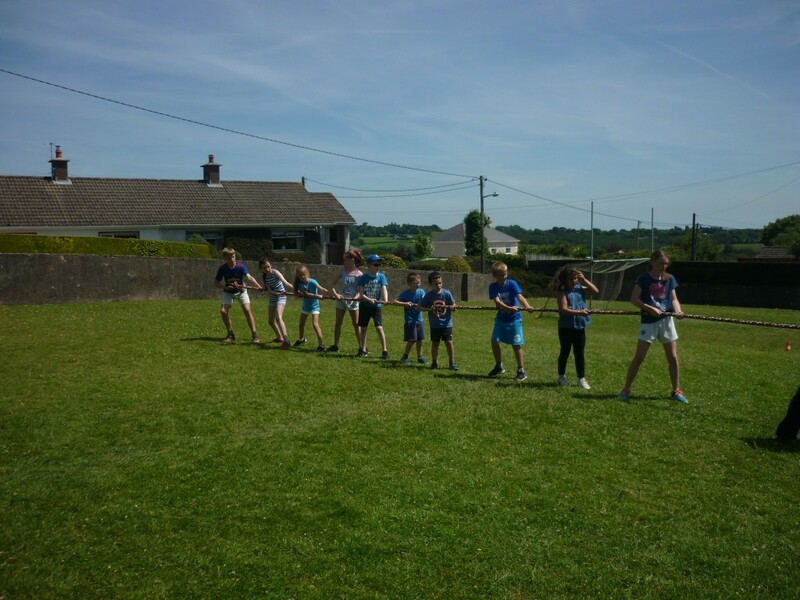 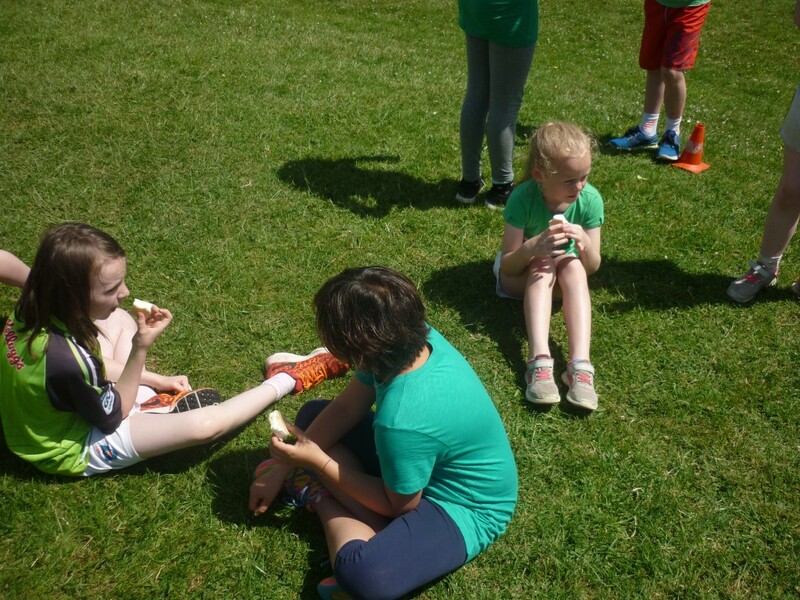 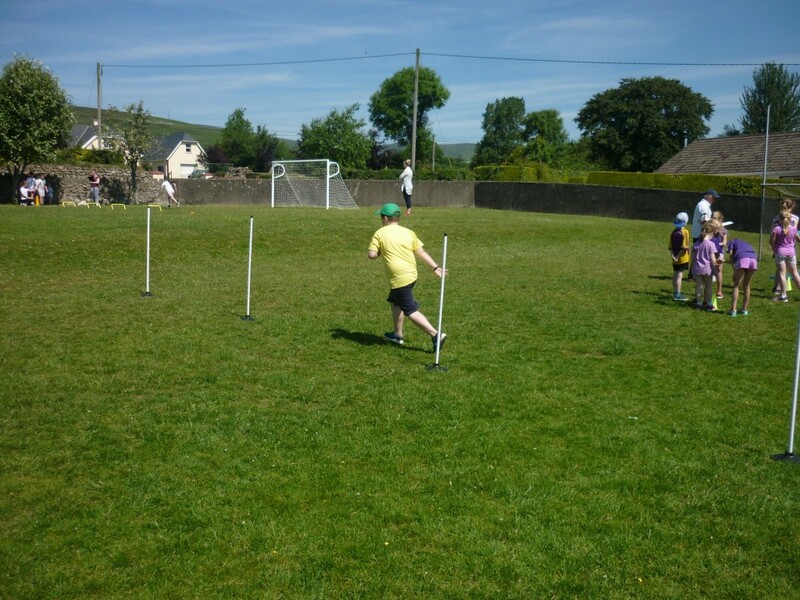 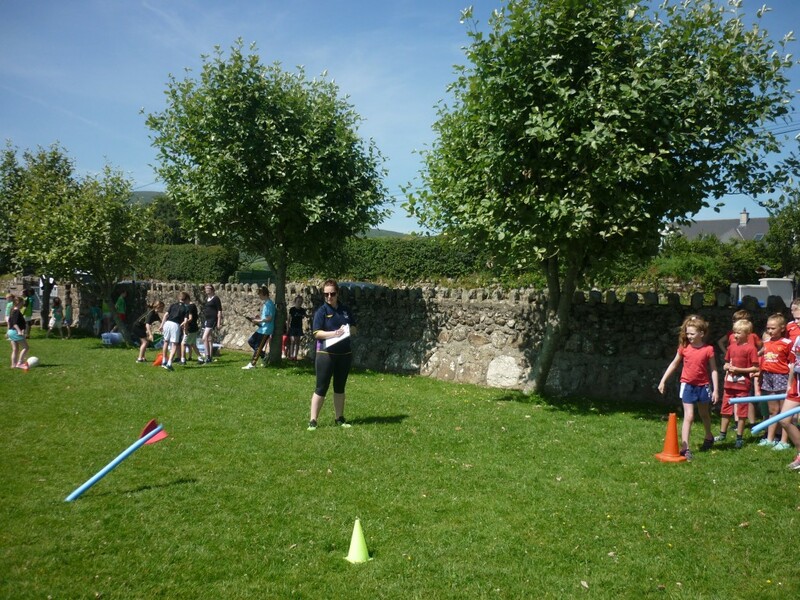 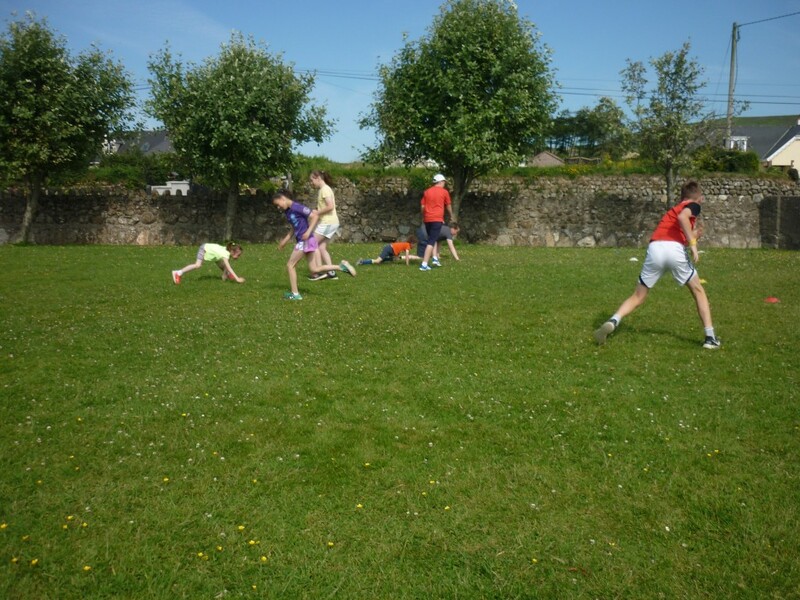 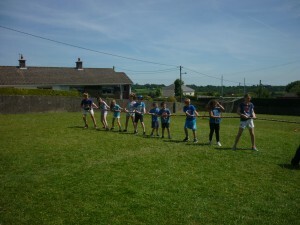 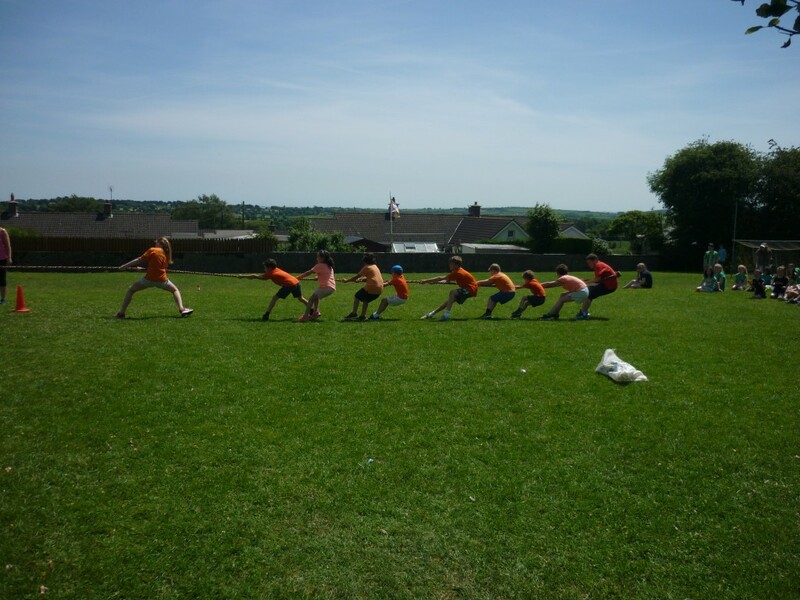 The day began with relay races – running relay, ball relay, wheelbarrow relay, t-shirt relay, mini hurl relay, frog relay and human relay. 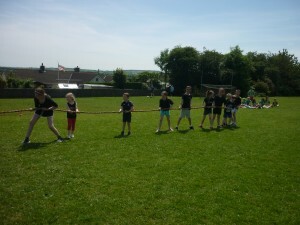 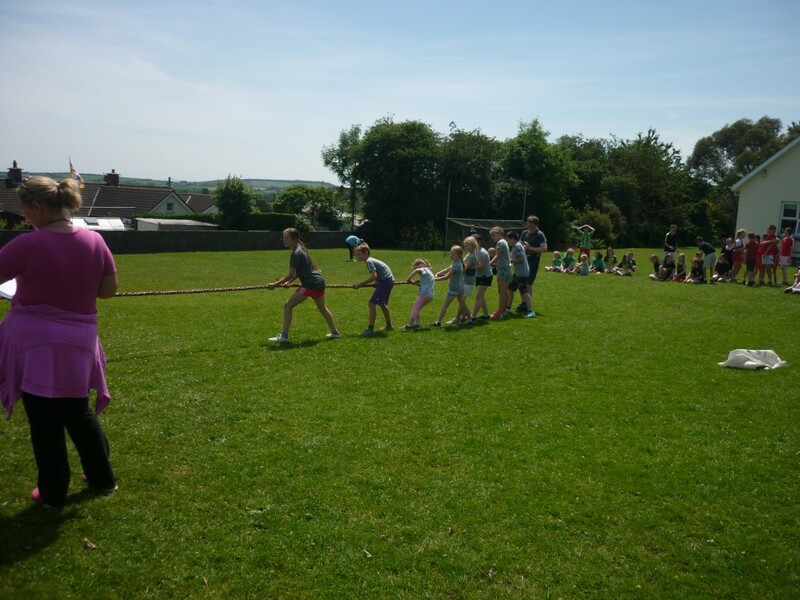 Next we had tug of war!!! 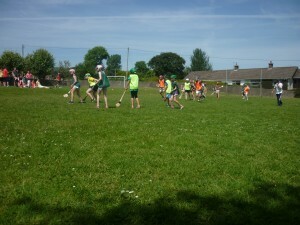 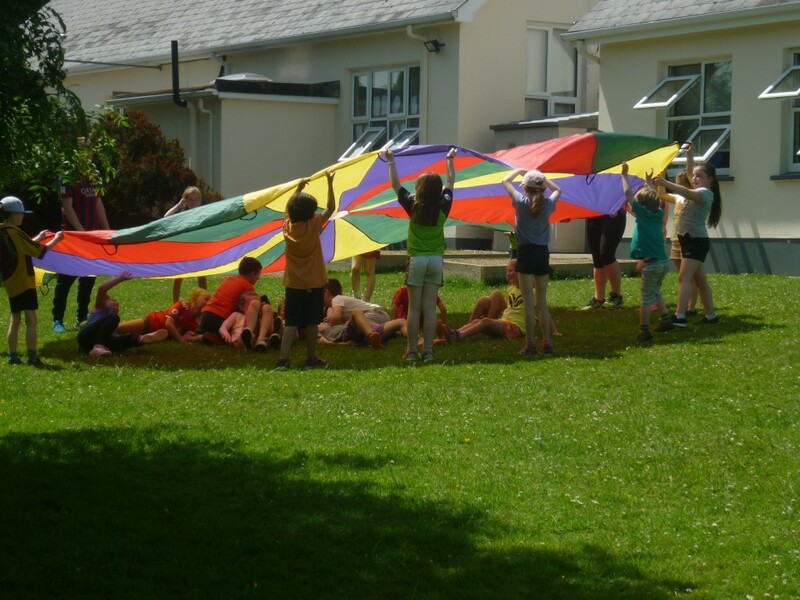 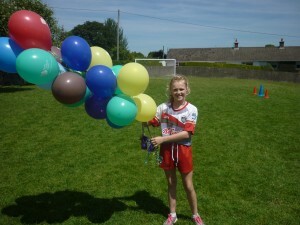 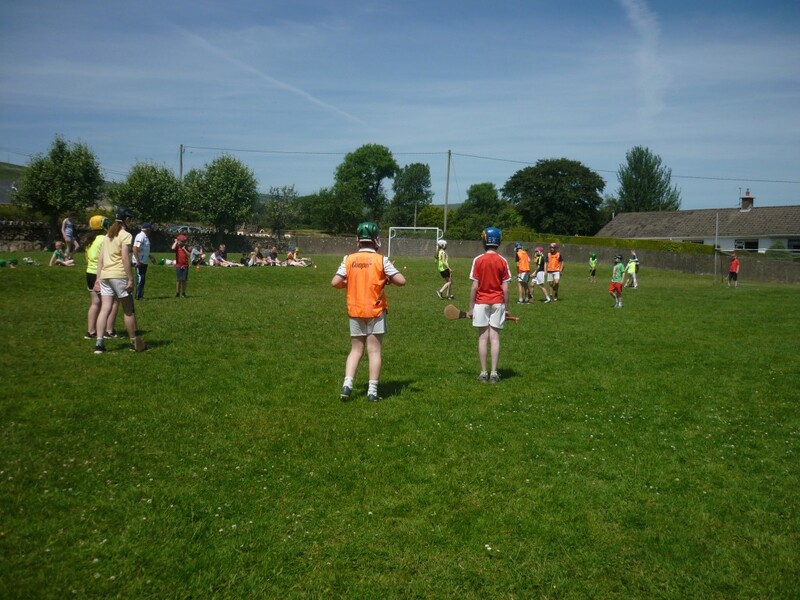 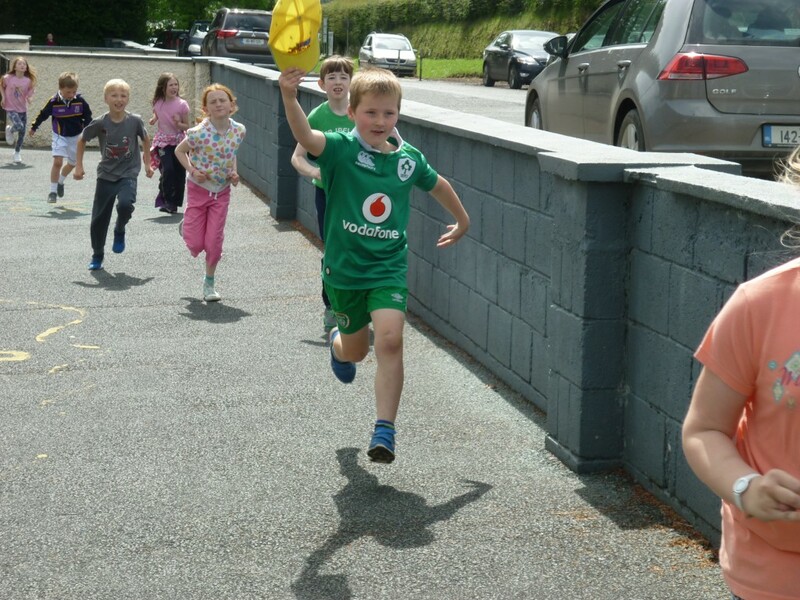 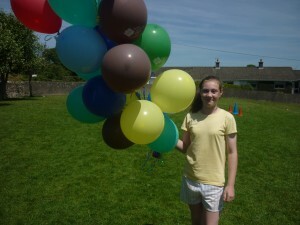 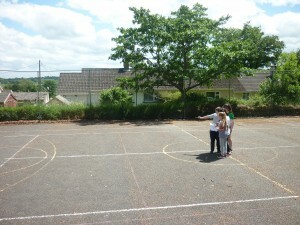 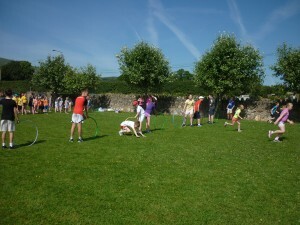 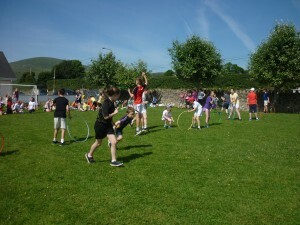 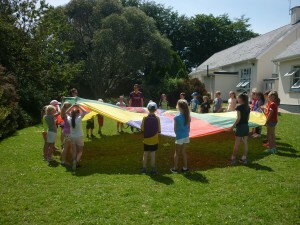 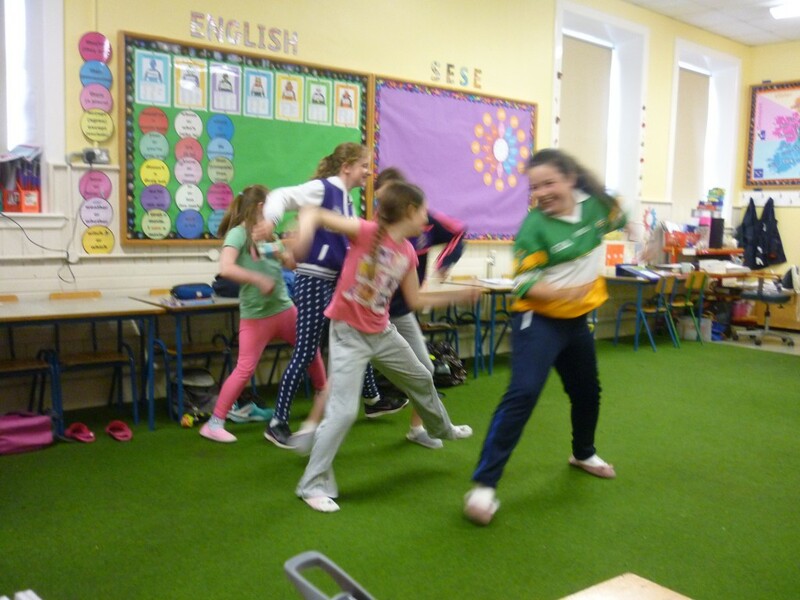 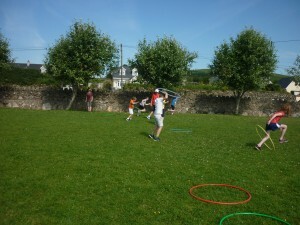 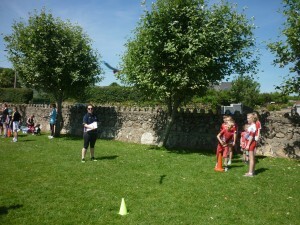 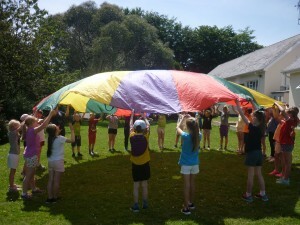 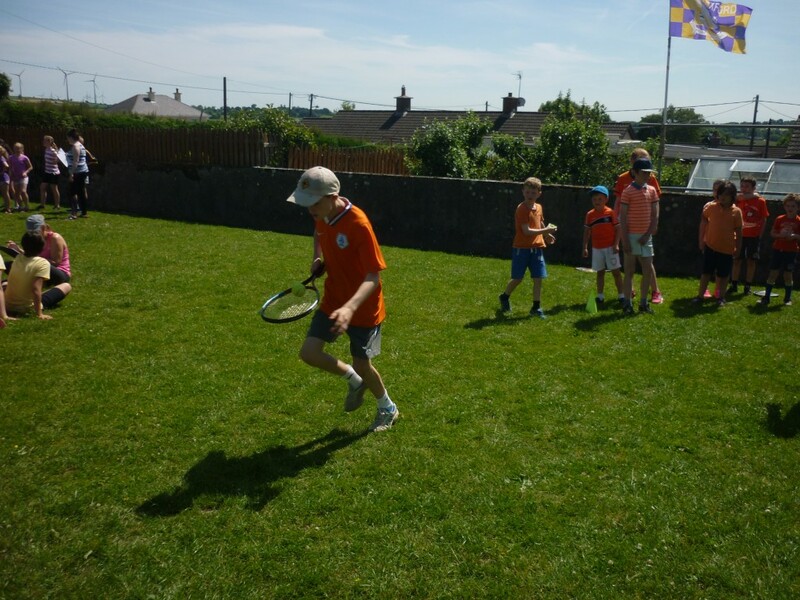 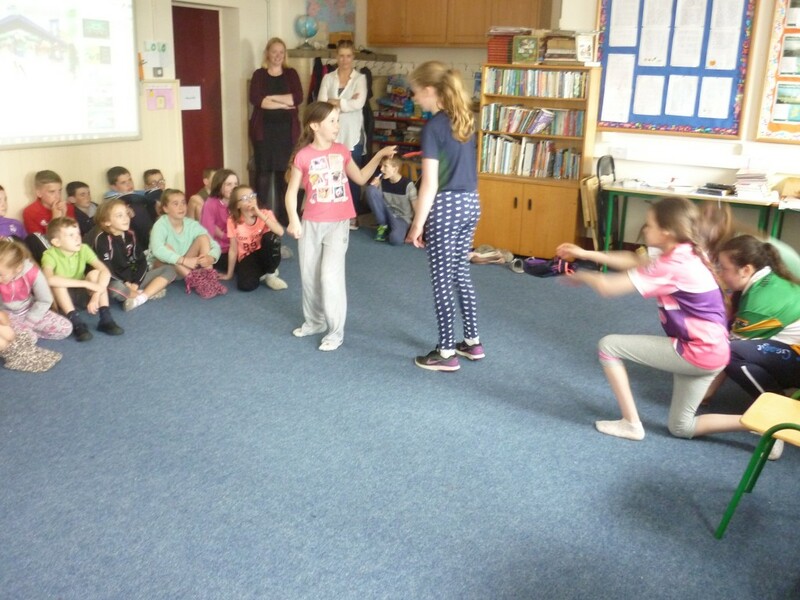 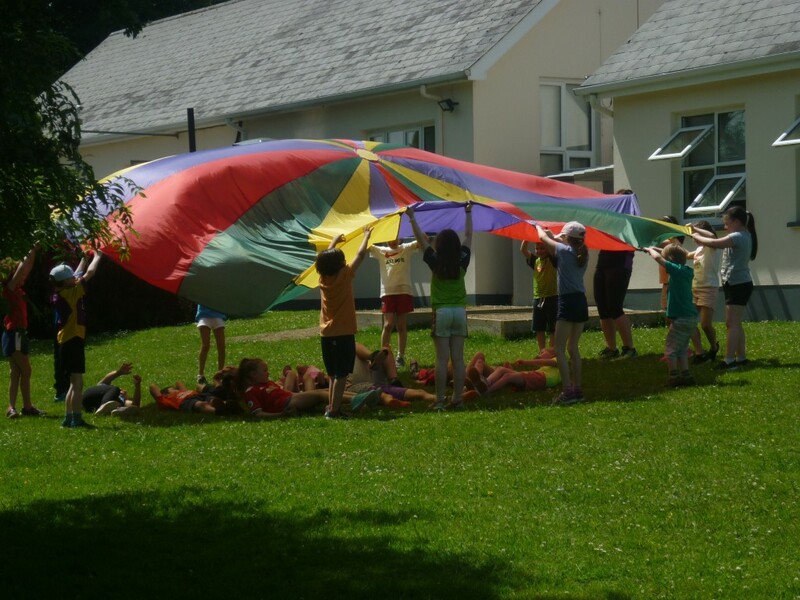 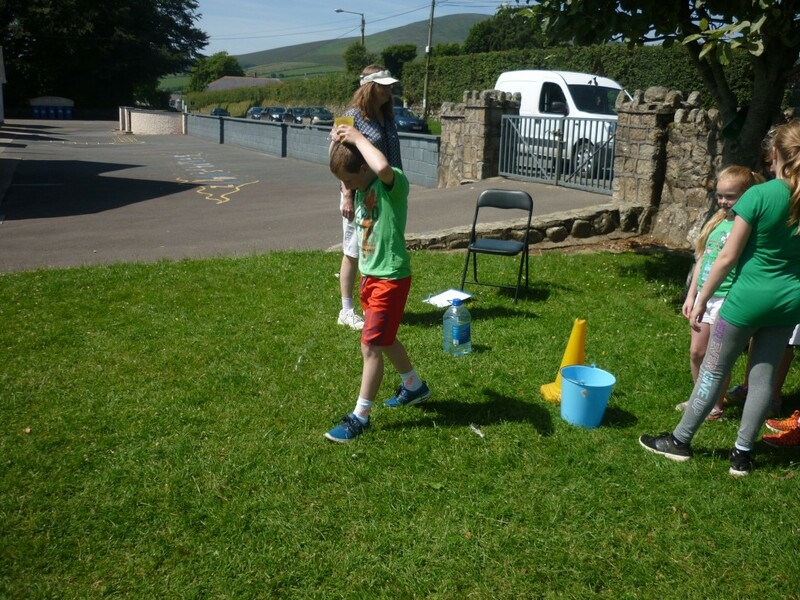 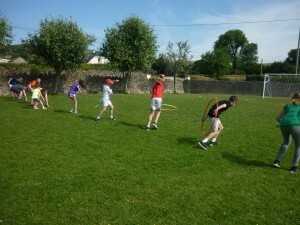 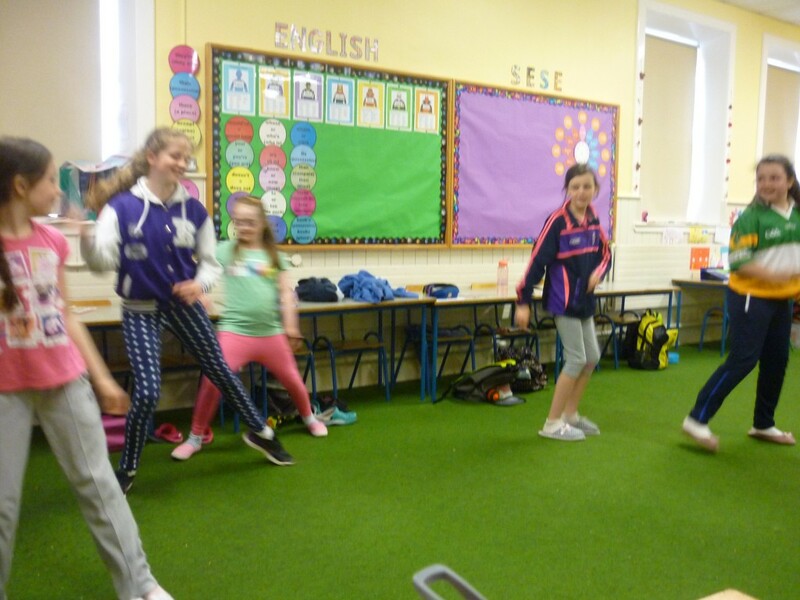 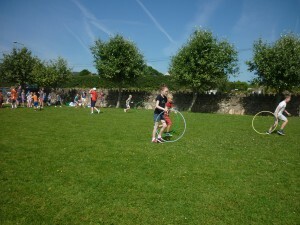 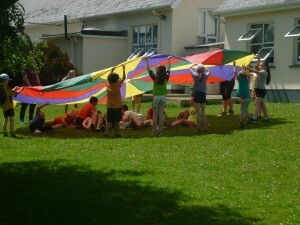 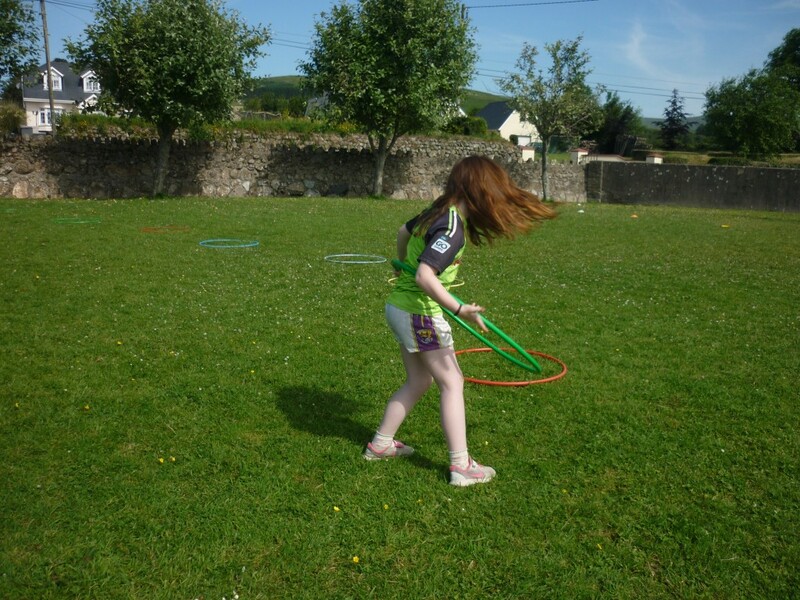 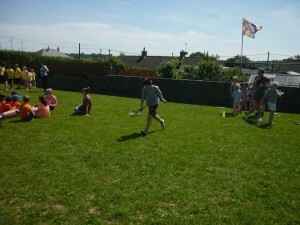 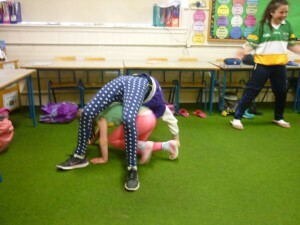 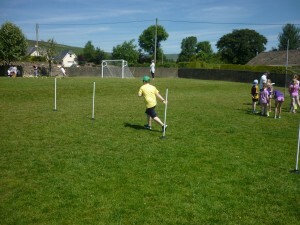 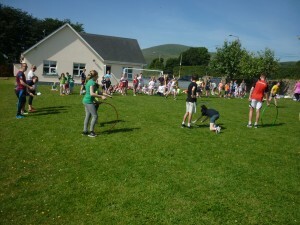 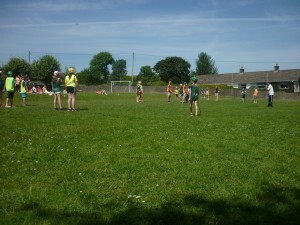 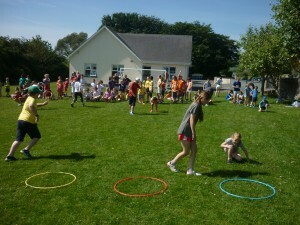 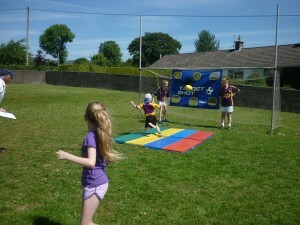 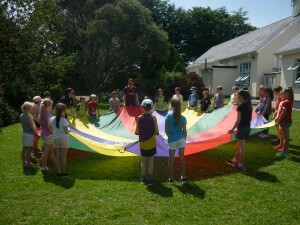 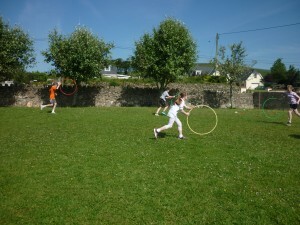 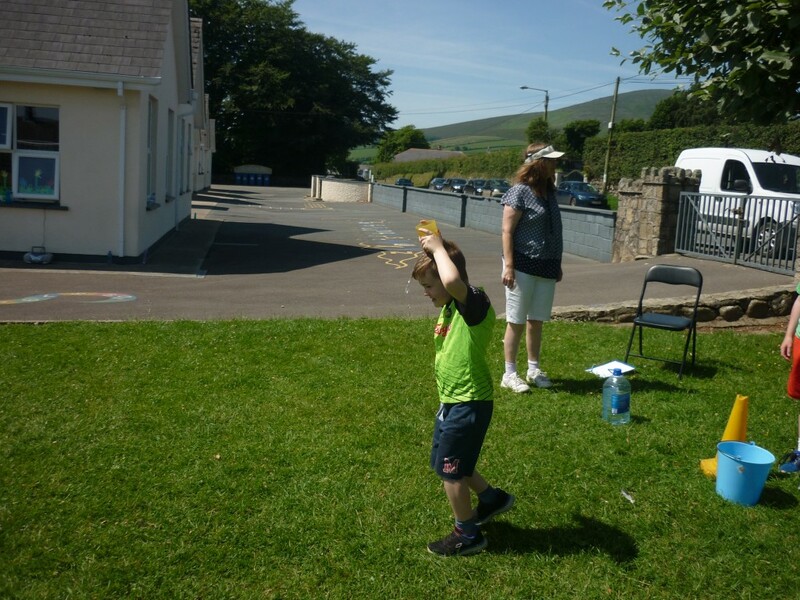 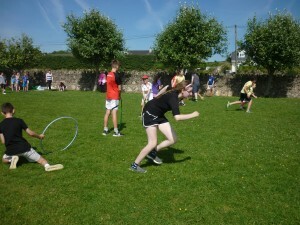 Finally we had a hurling blitz and parachute games!!! A meeting took place on Monday 26th June and the next meeting will take place on Tues 19th Sept.
* Pupils will take place in Sing out Loud 2017, in the Wexford Opera House. 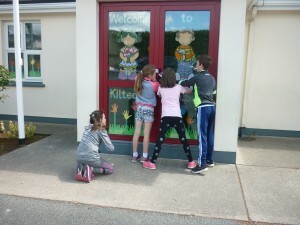 *Congratulations to Ms.Danielle O Neill on her permanent position in Kiltealy N.S. 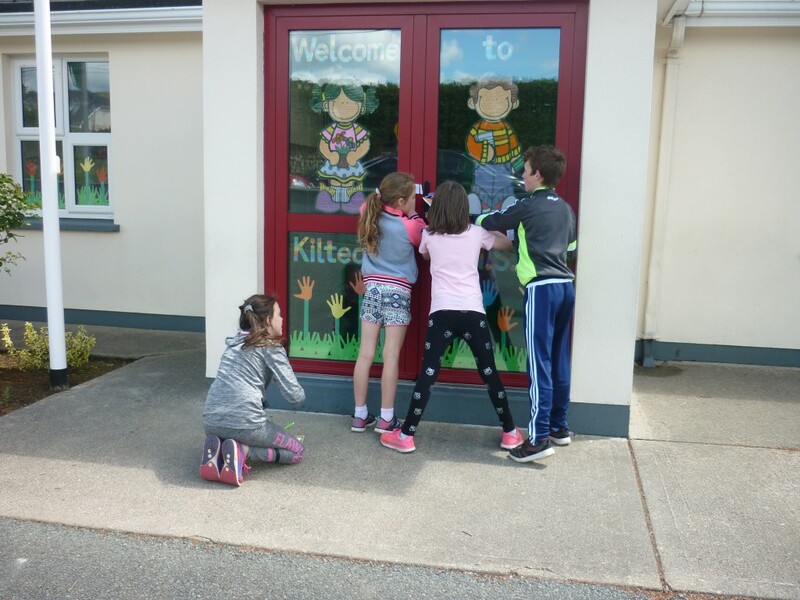 *Thanks to Elizabeth Teehan for her many years dedication to our pupils. 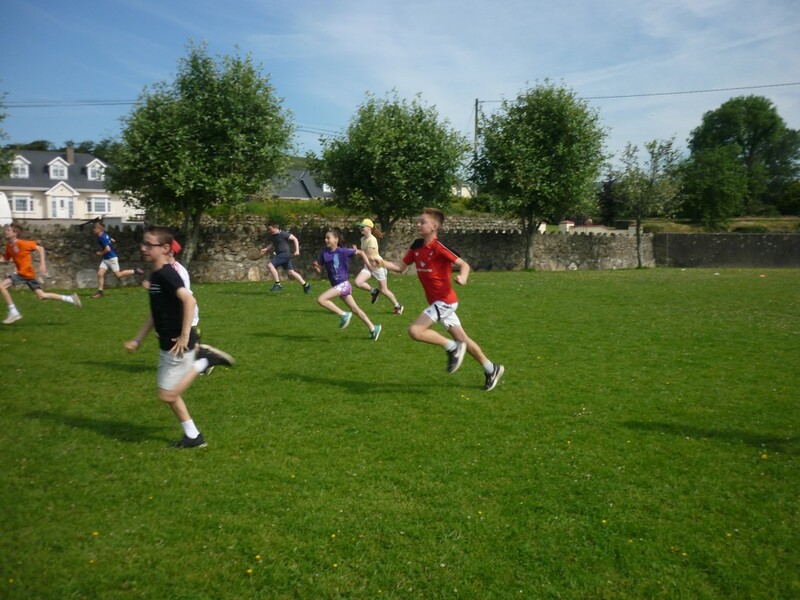 *Best of luck to our 6th Class who are graduating this June. *Split the Pot will continue for the summer, thank you for your constant support of our school. *Congratulations to our pupils and staff on our recent Rackard League success and celebrations. *Congratulations to our former pupil Colin Bowe and Barry O Neill- Champion Point to point trainer and jockey. 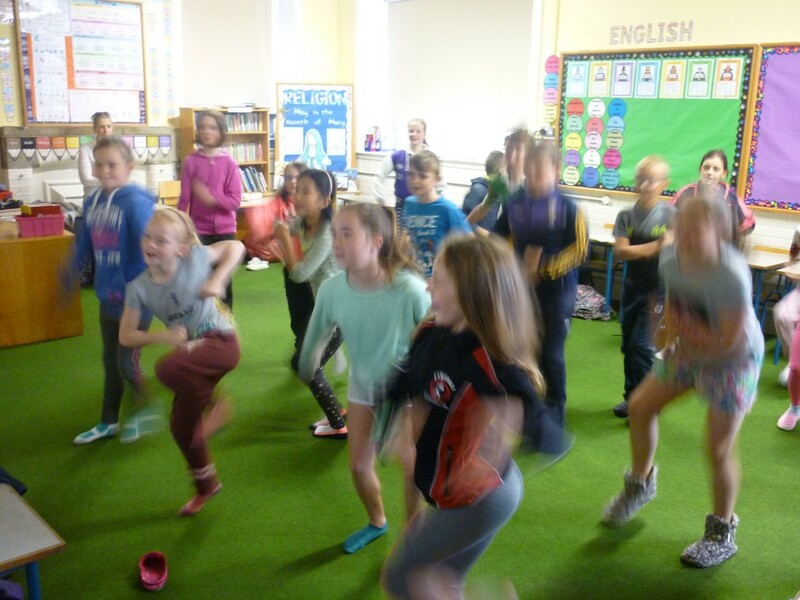 A massive well done and congratulations to our pupils from 3rd – 6th who took part in the Sing Out Loud Concert in Wexford Opera House on November 19th. 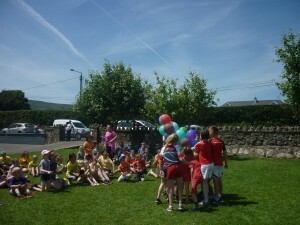 5th & 6th class photos!!! 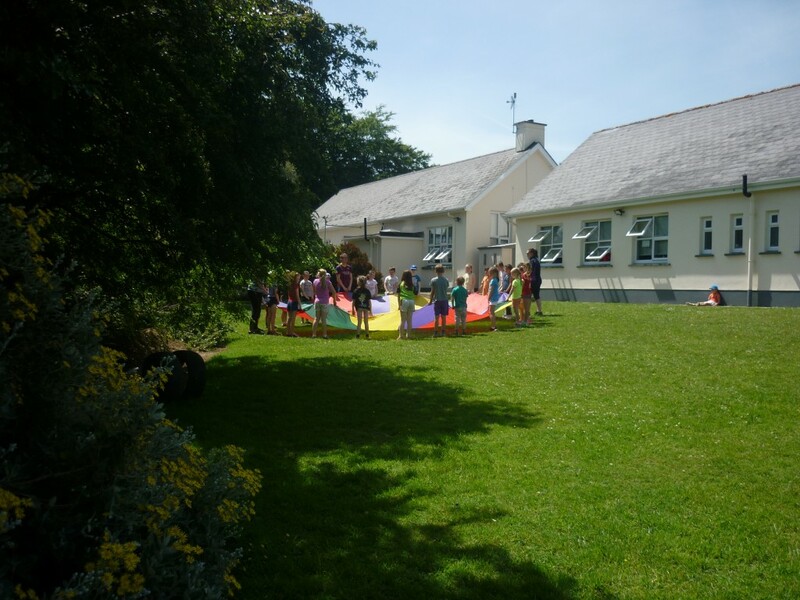 NEW SCHOOL YEAR 2017/18 STARTS HERE!!! 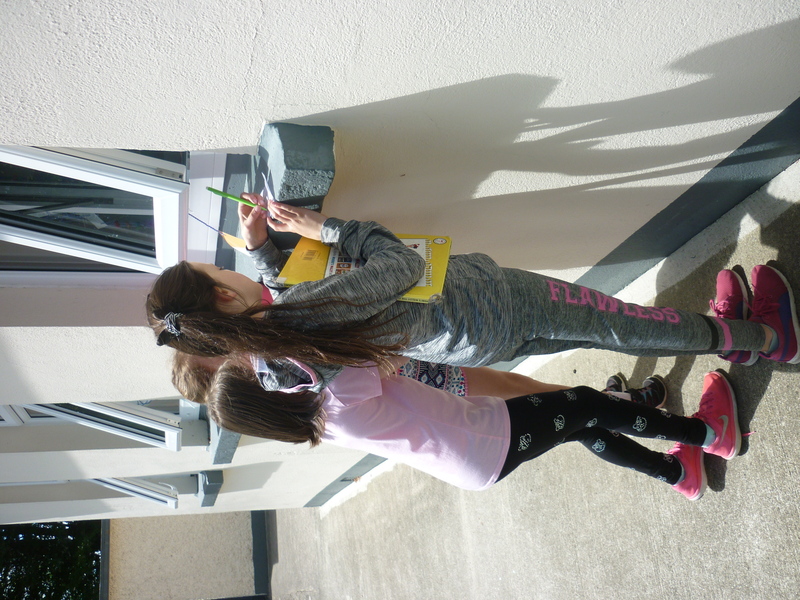 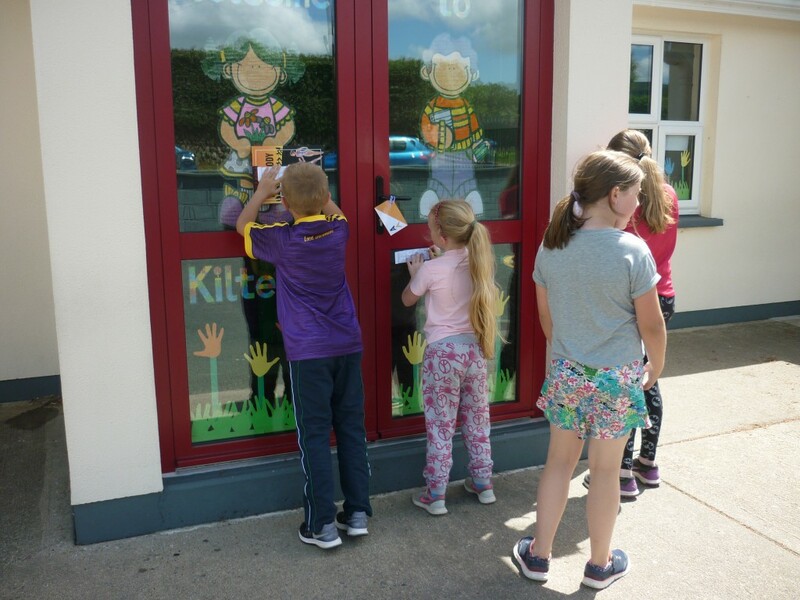 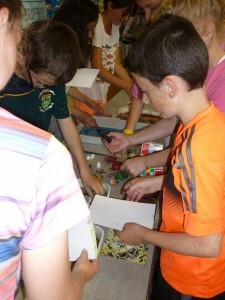 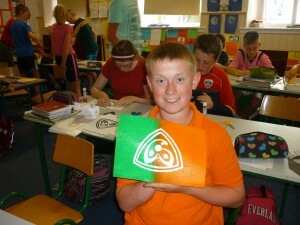 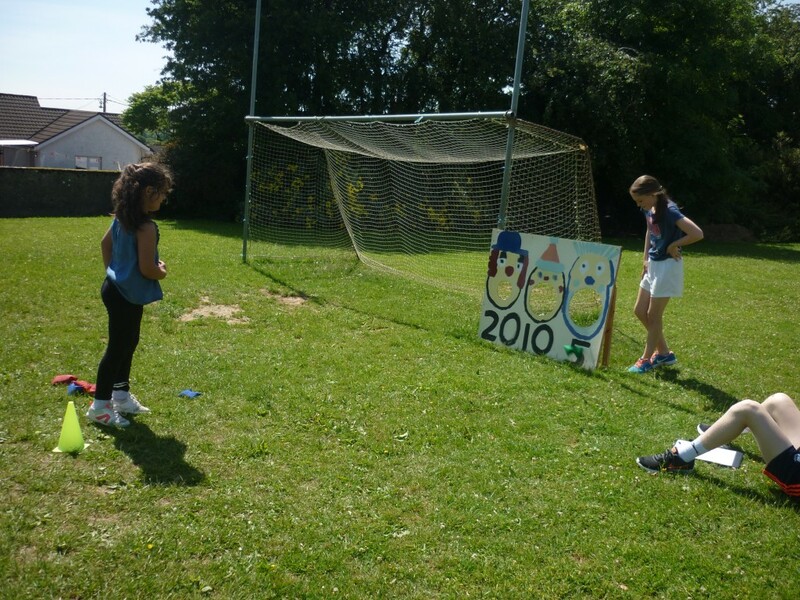 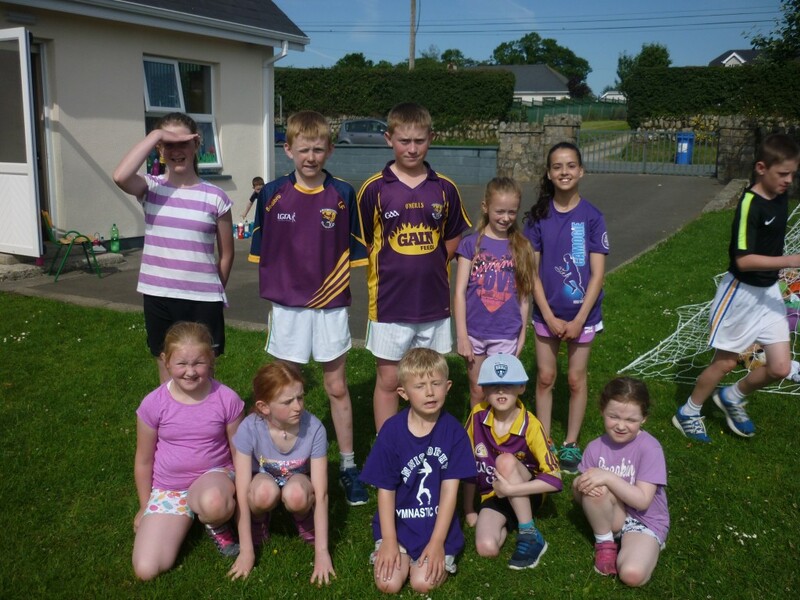 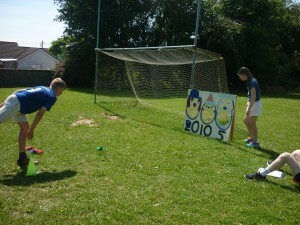 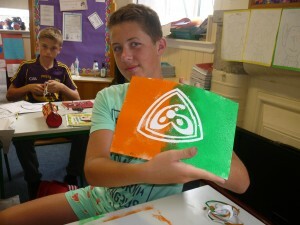 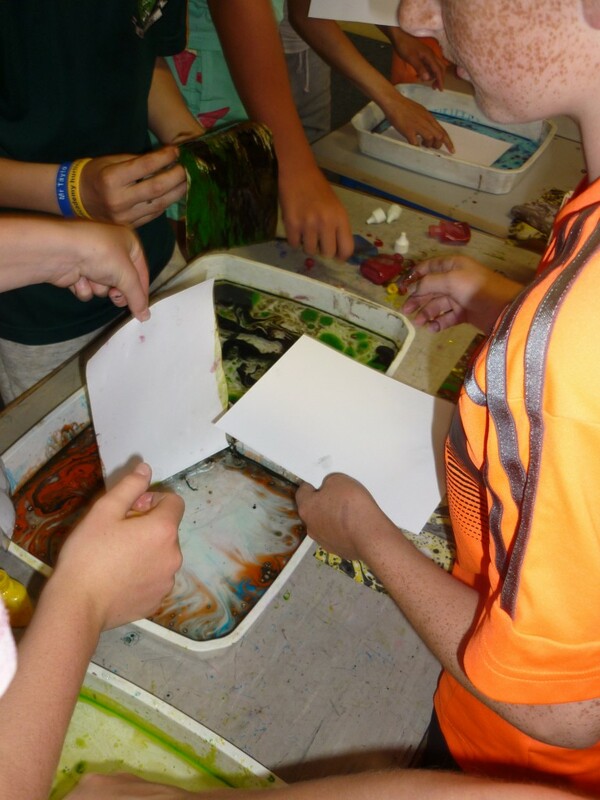 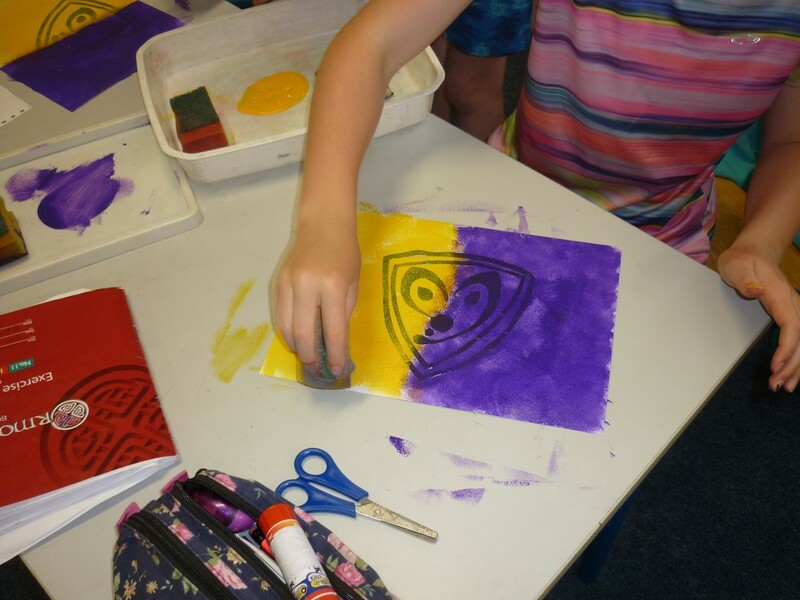 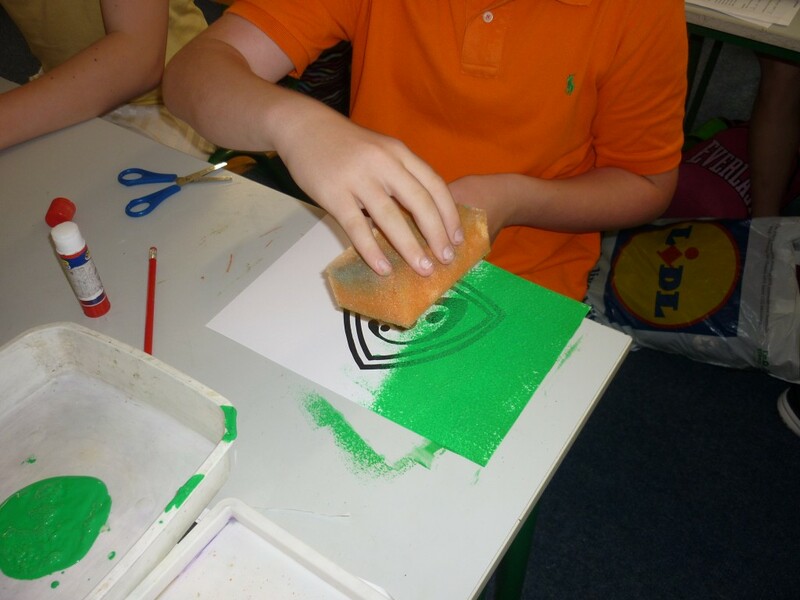 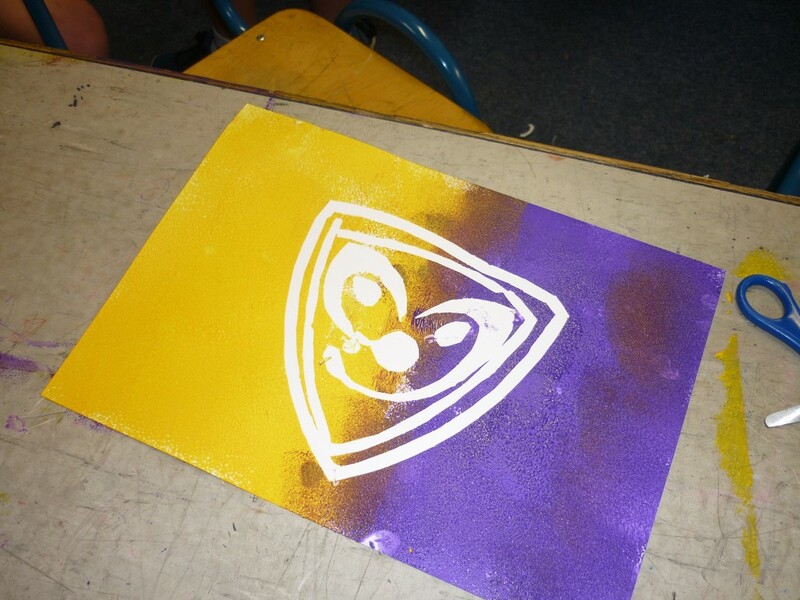 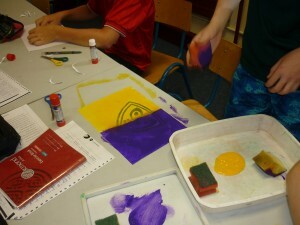 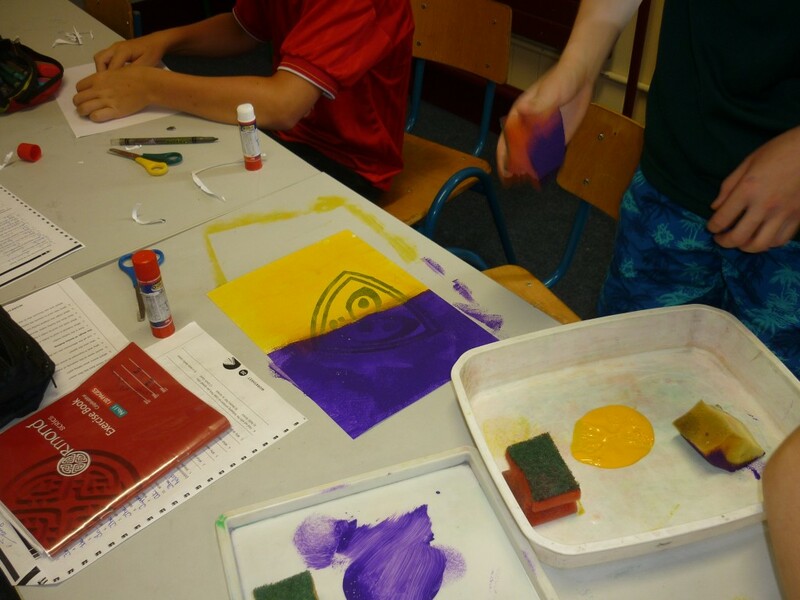 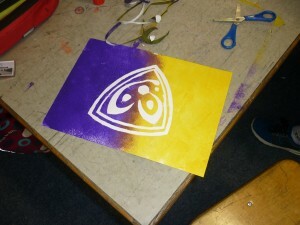 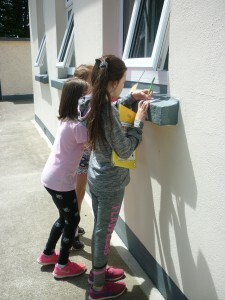 5th & 6th made their own GAA stencils and sponge painted the Wexford and Duffry colours over them. 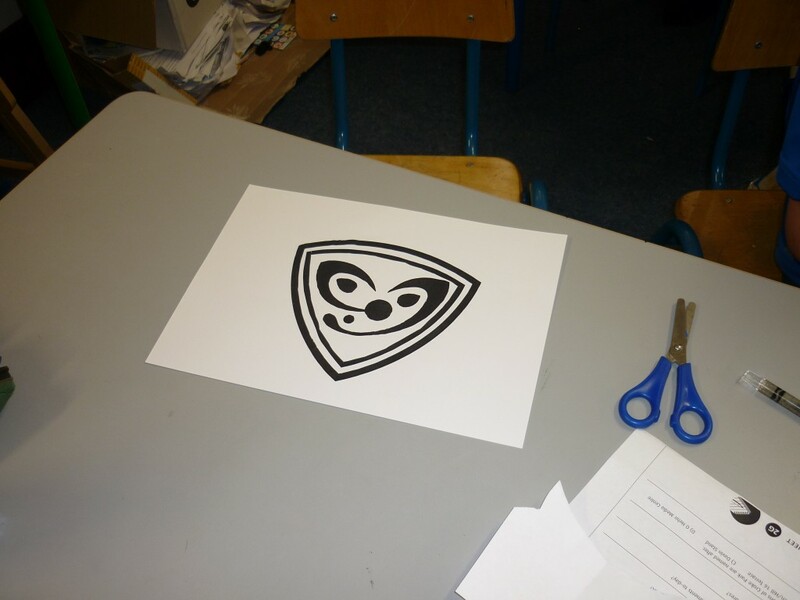 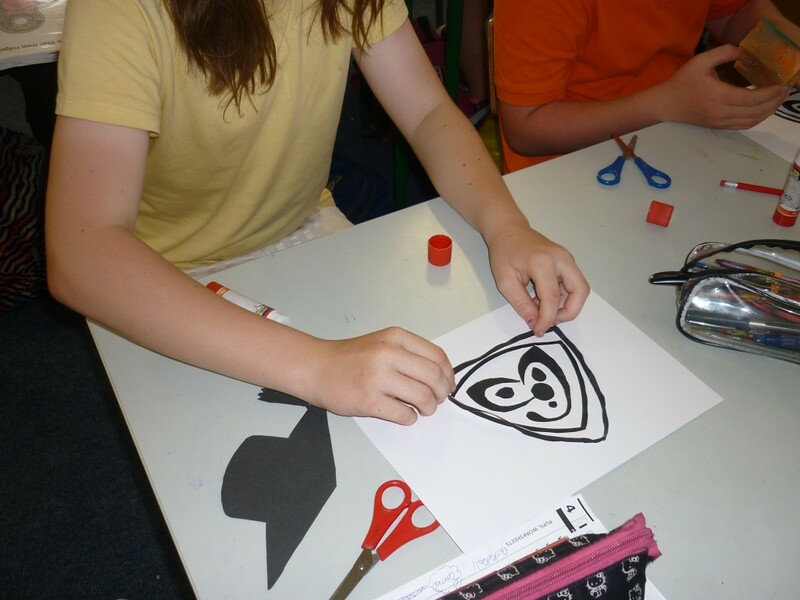 The then peeled away the stencils and were left with a these fantastic GAA Logos!!! 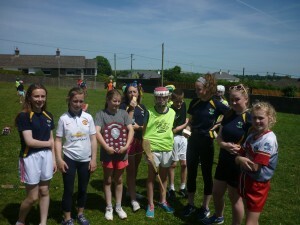 Both the Hurlers and Camogie Players lifting the cups in Patrick’s Park. 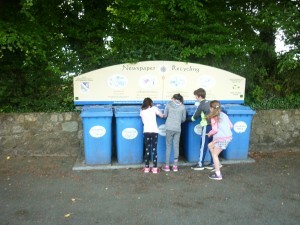 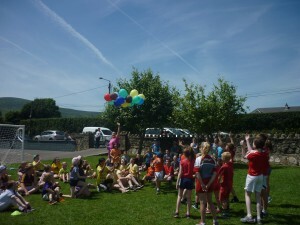 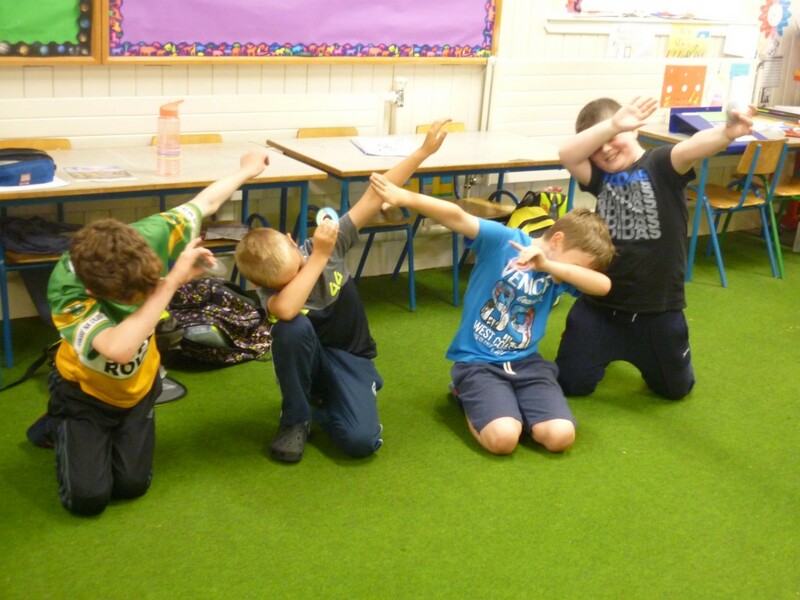 Celebrations in Kiltealy NS the next day!!! 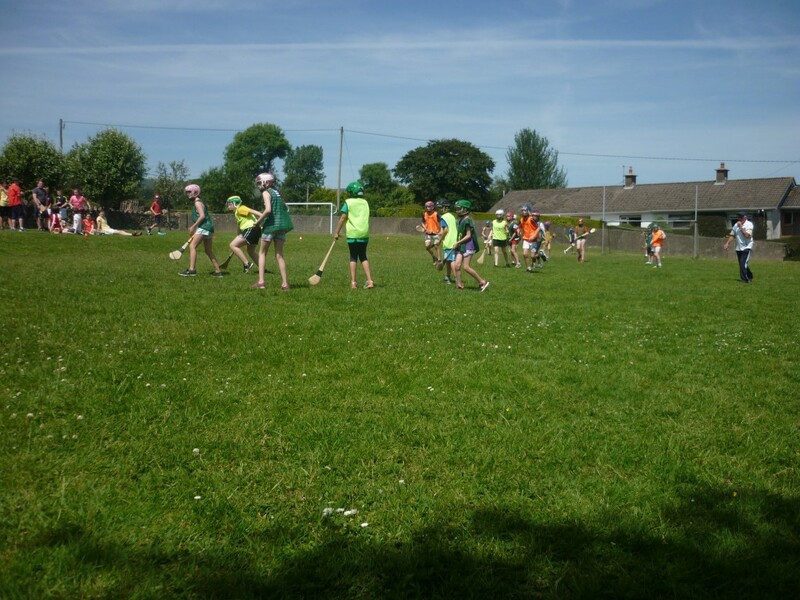 Congratulations to the 5th & 6th class pupils on an outstanding performance in the recent Schools Football Blitz in Coolree. 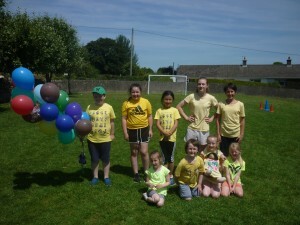 There were 6 teams presetn on the day. 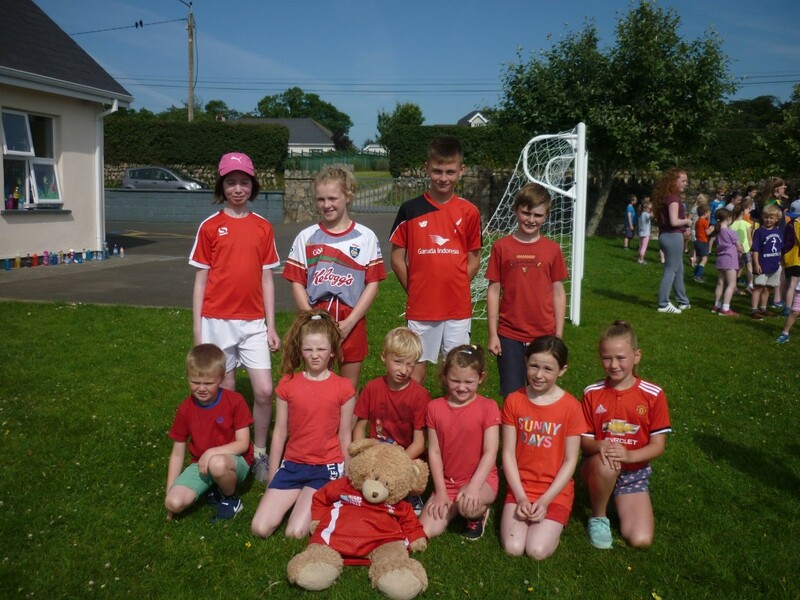 Kiltealy topped the table on points by the end of the 5th round having won four of their games and drawing just one against near rivals Caim. 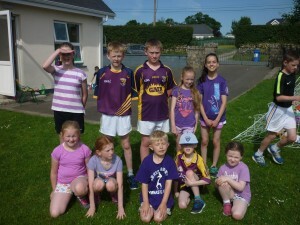 they met came again in the A final but unfortunately lost our to a good Caim side. Kiltealy were gracious as ever in defeat. 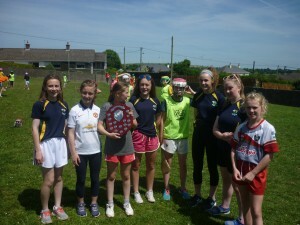 Well done to all involved and a big thank you to Jim Copper for attending on the day as part of our GAA management team. 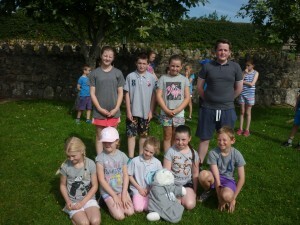 Jim presented the runner-up medals to the Kiltealy Team the next morning during their weekly training session. 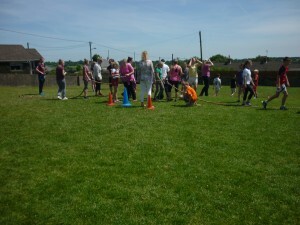 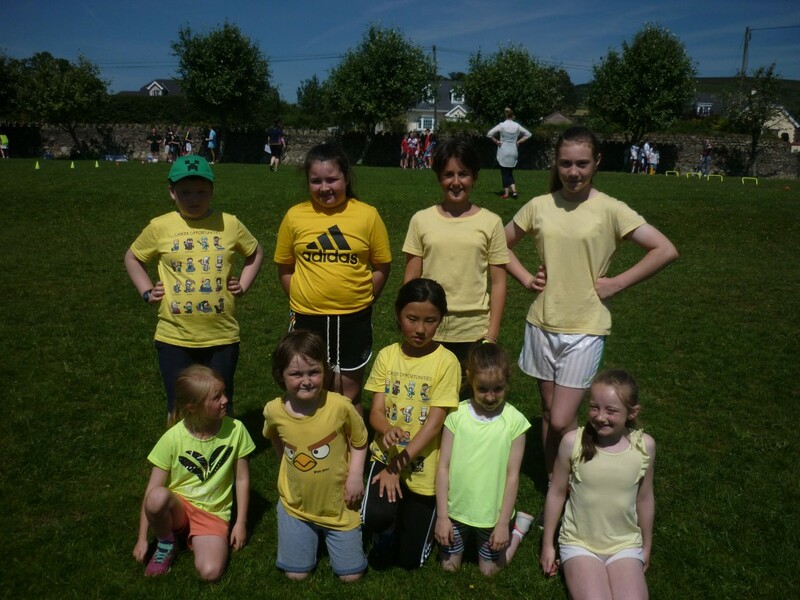 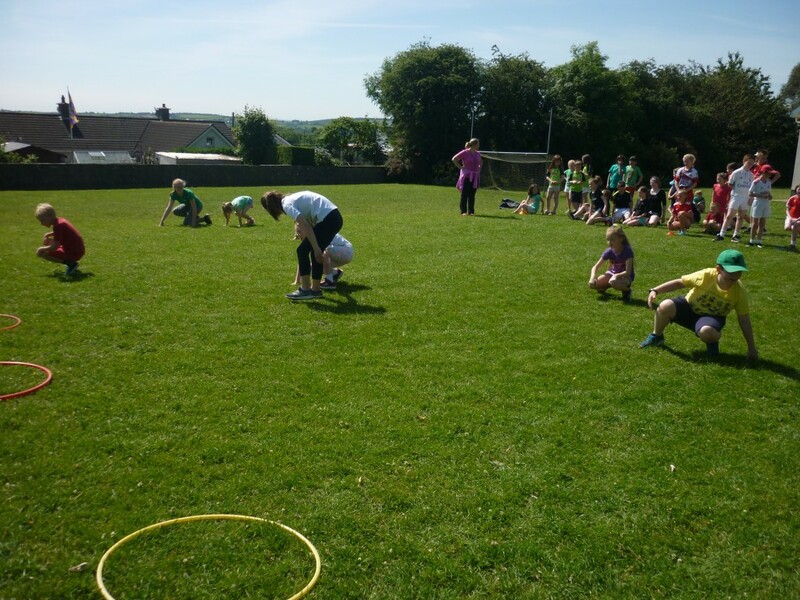 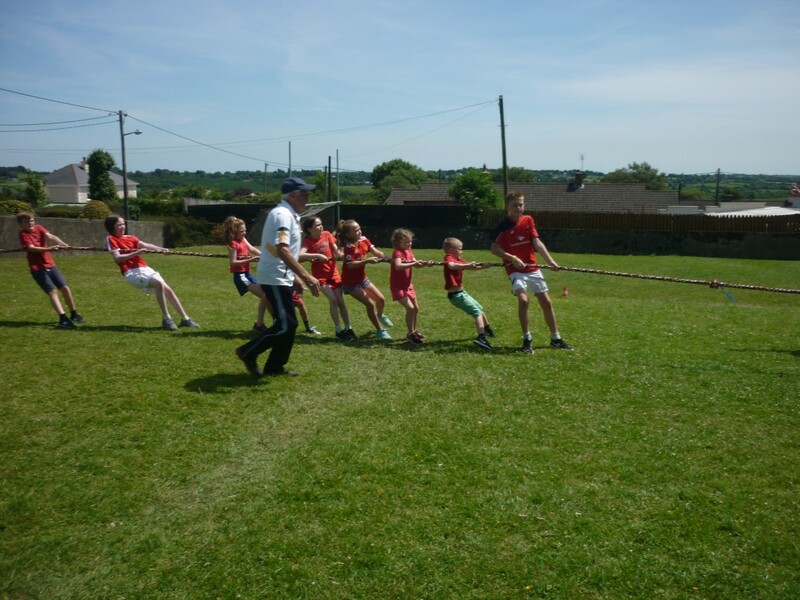 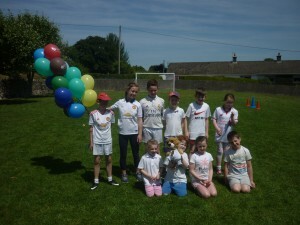 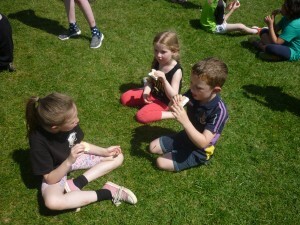 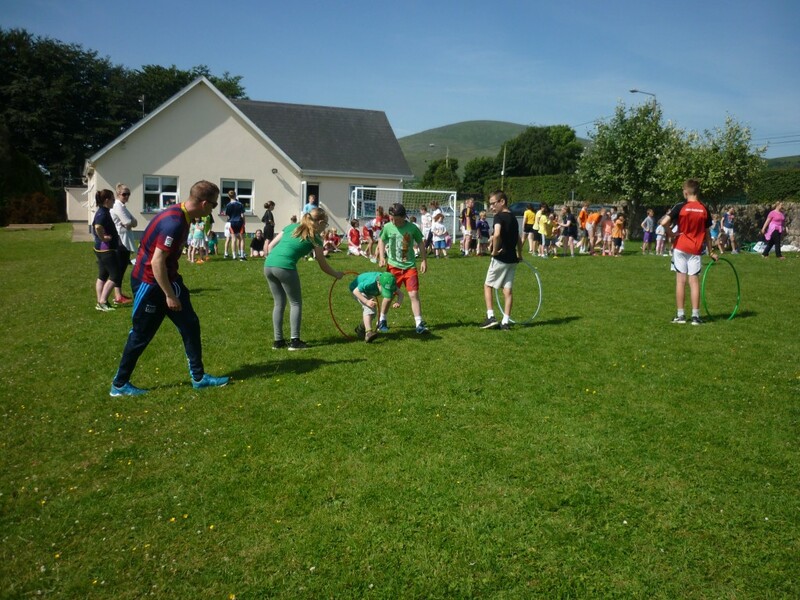 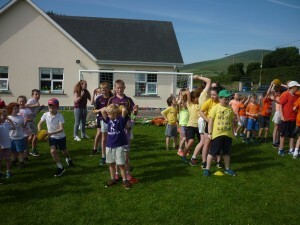 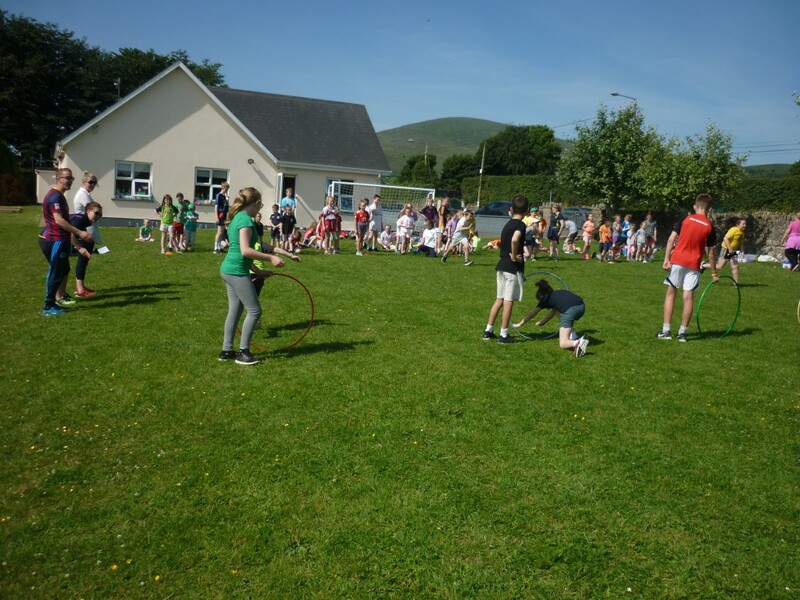 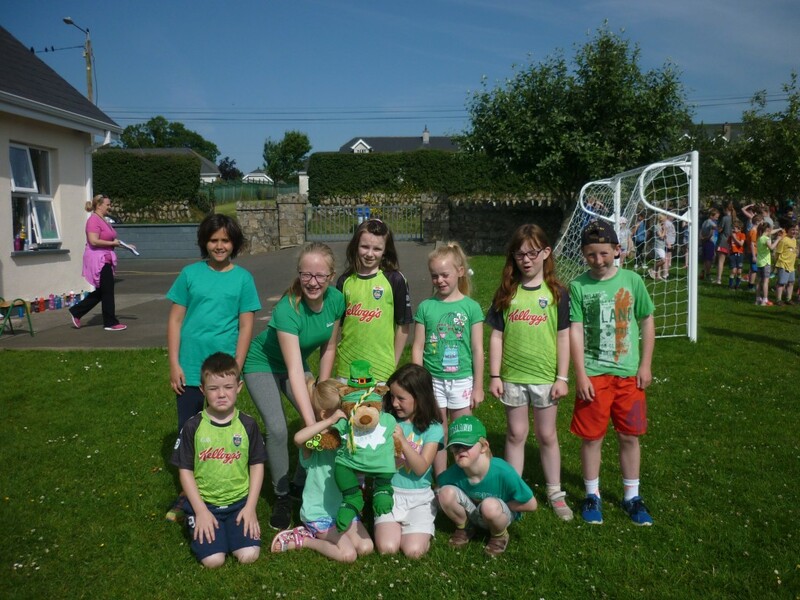 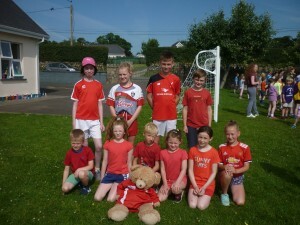 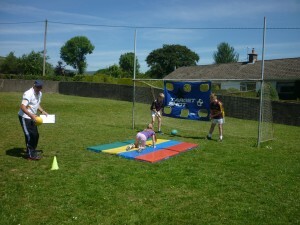 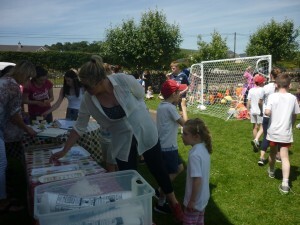 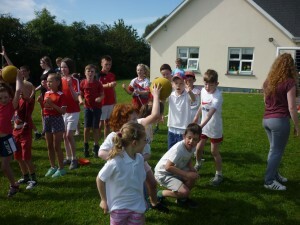 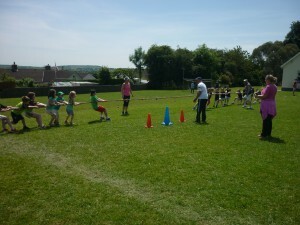 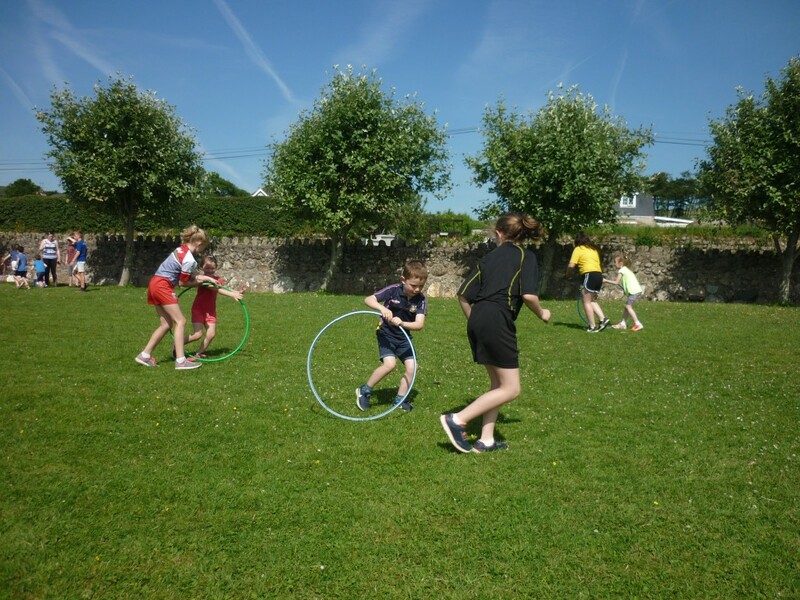 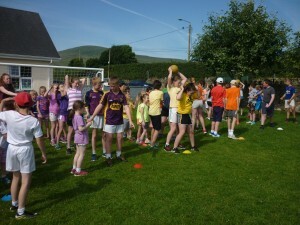 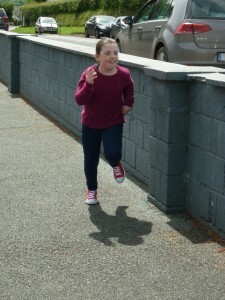 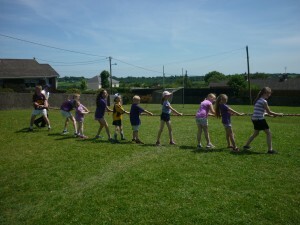 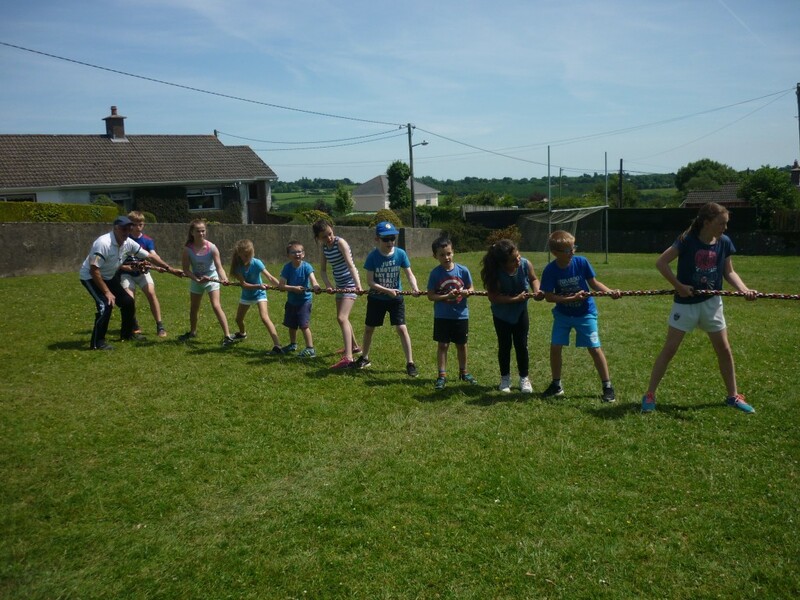 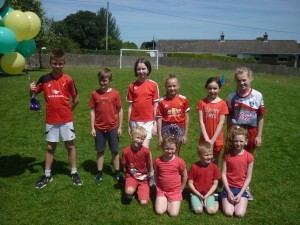 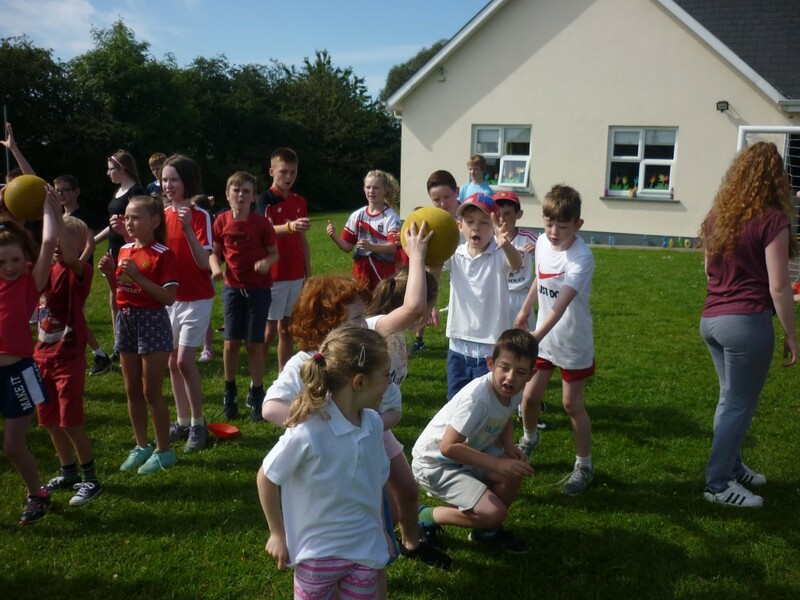 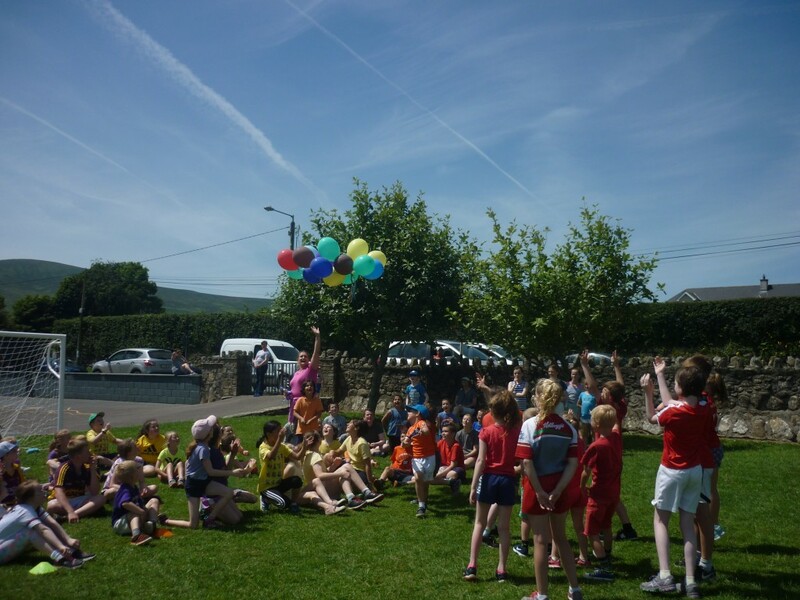 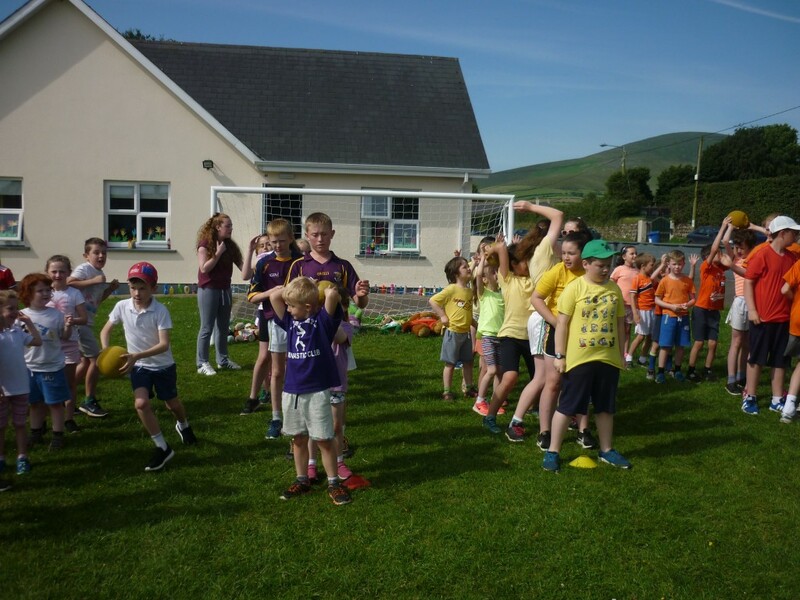 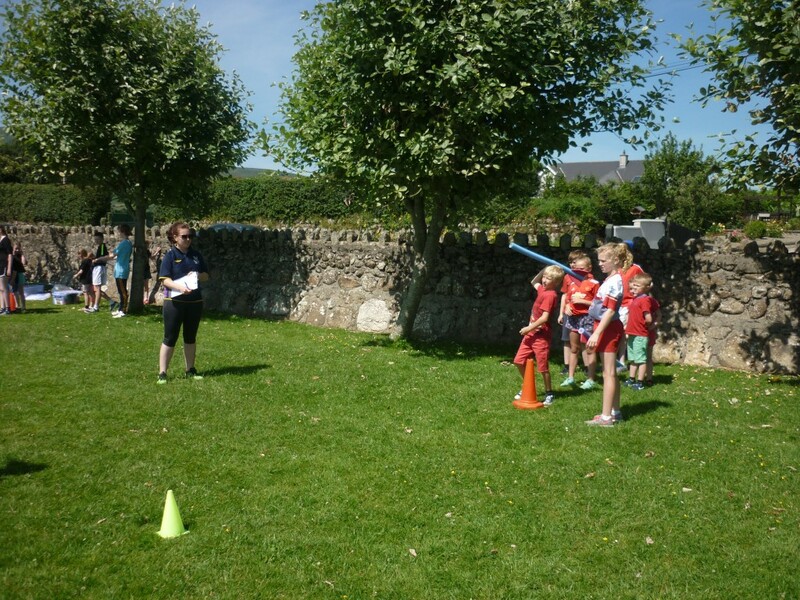 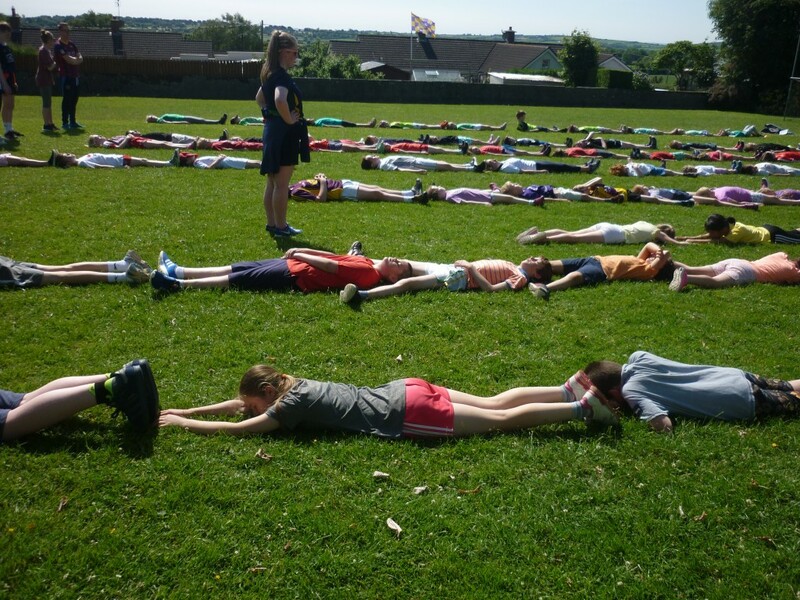 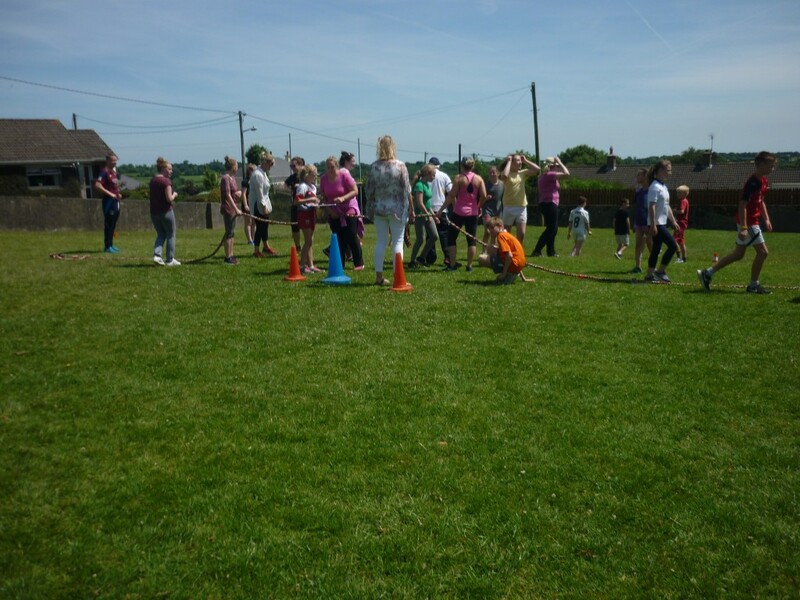 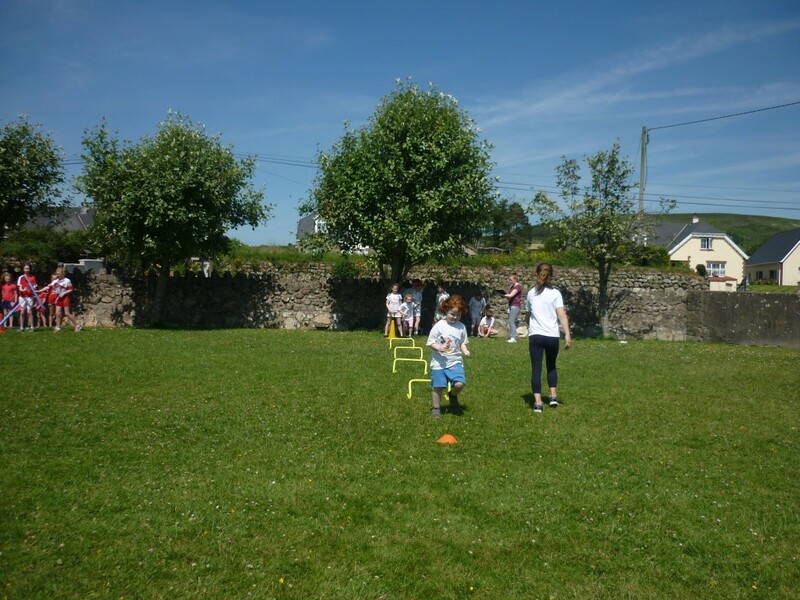 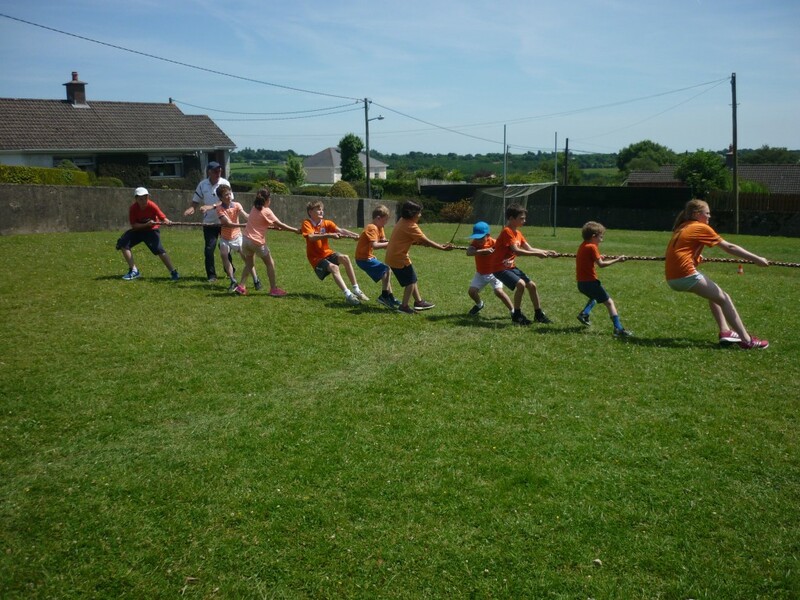 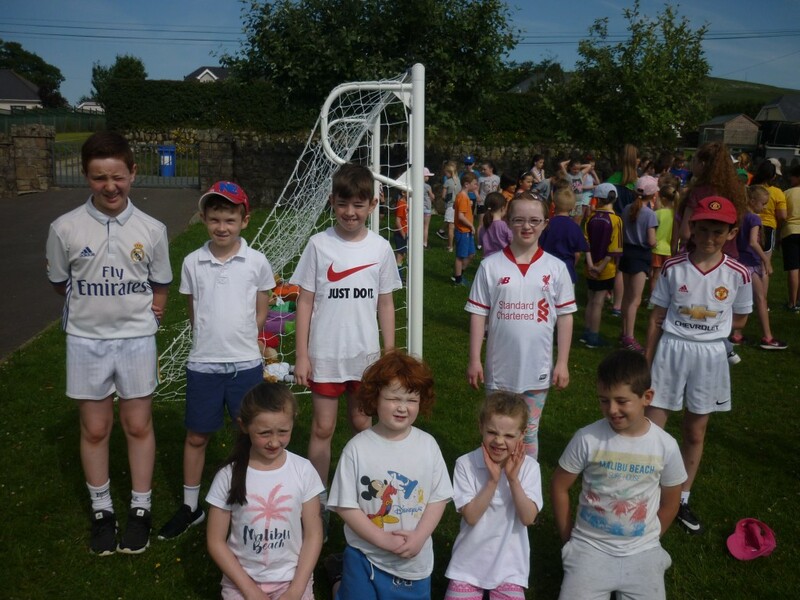 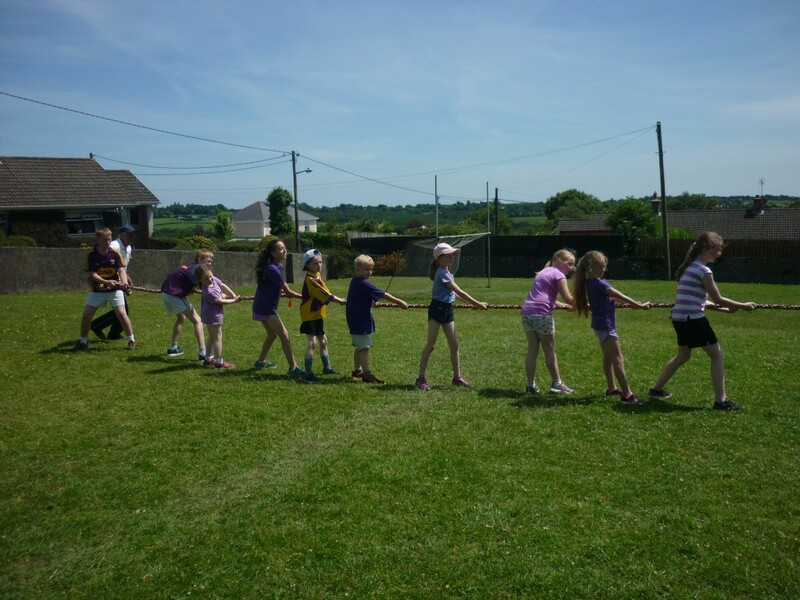 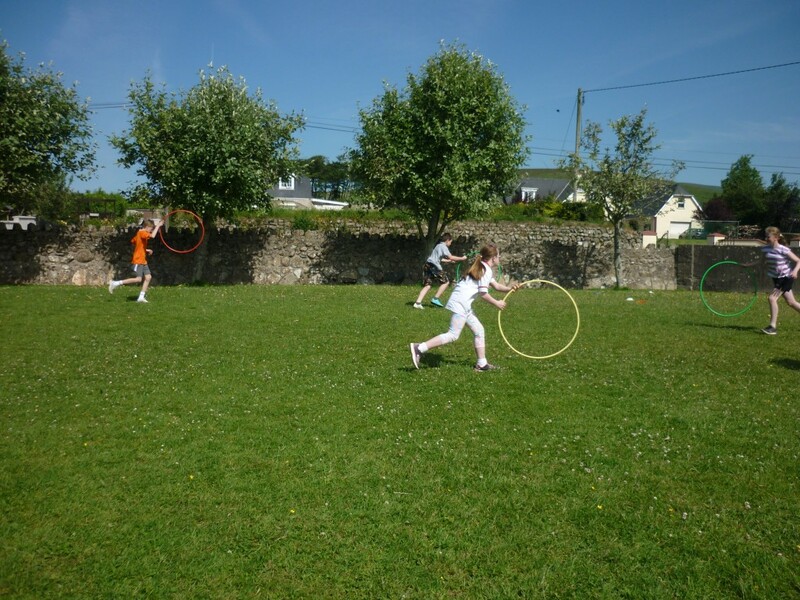 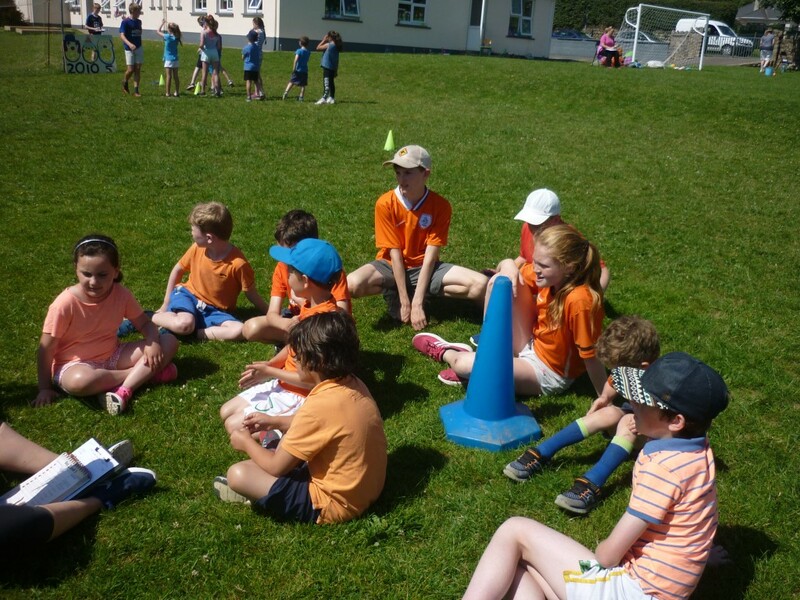 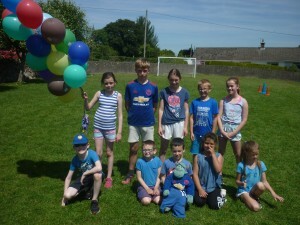 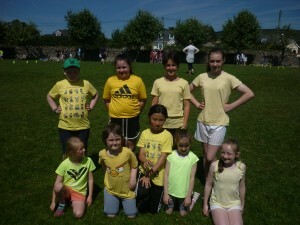 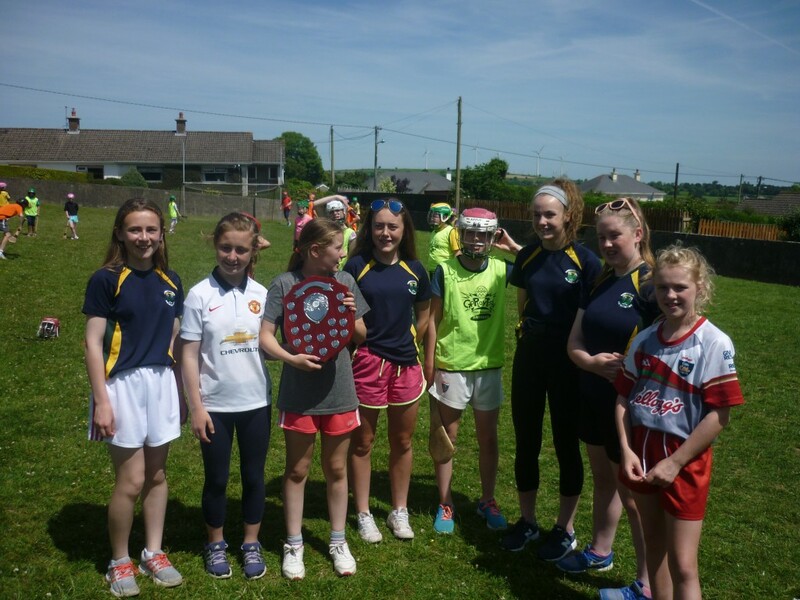 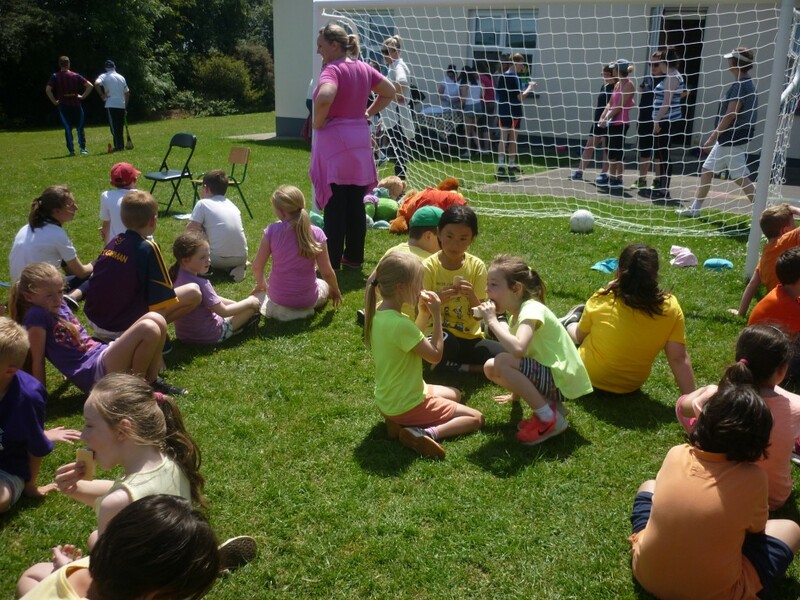 Congratulations to all who took part in the recent Co. Wexford Primary School Sports Day held in Enniscorthy Sports Hub. 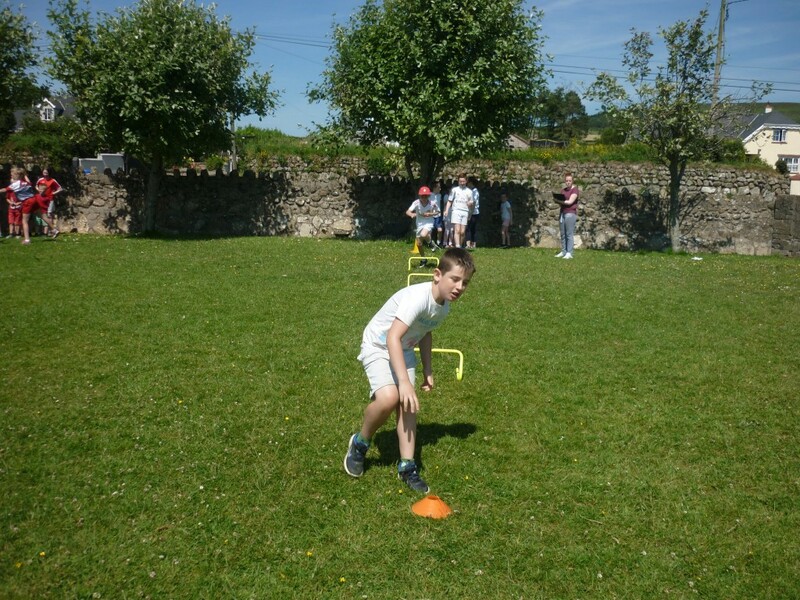 Our big winner on the day was Dannan Long who won gold in the U12 high jump competition. 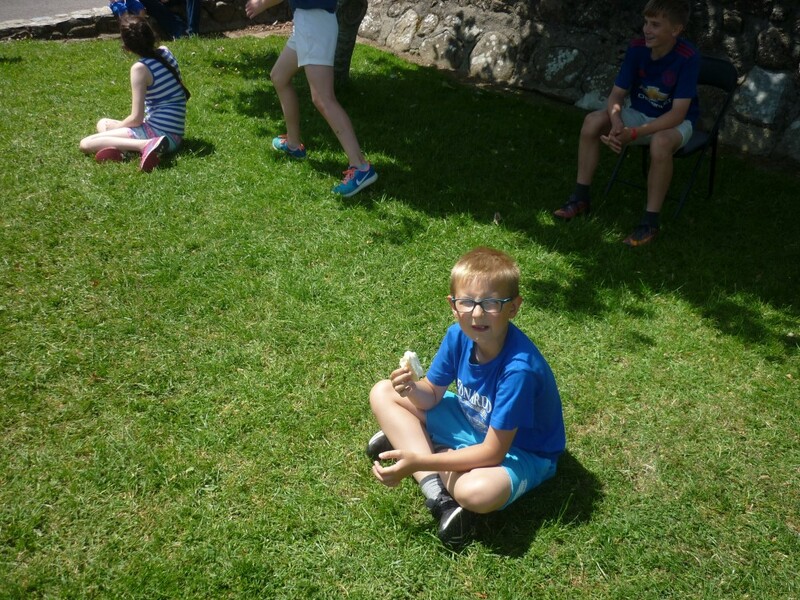 This is a huge achievement and we are all very proud of Dannan. 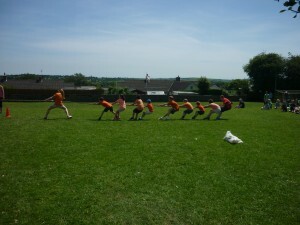 All competitors put in great performances and we were unlucky not to qualify to the finals in a number of events. 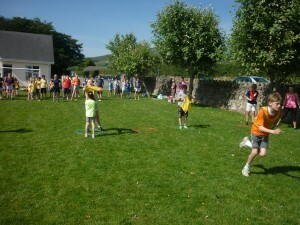 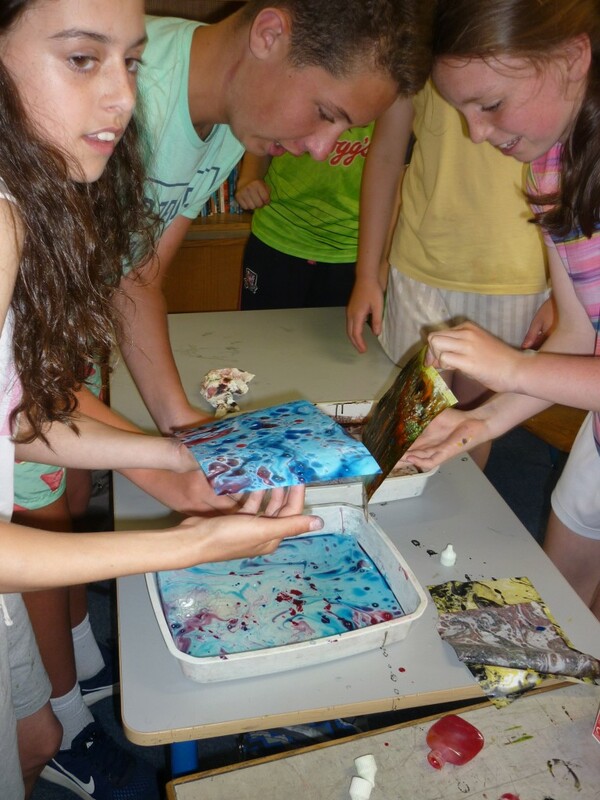 A great time was had by all on our recent school tour. 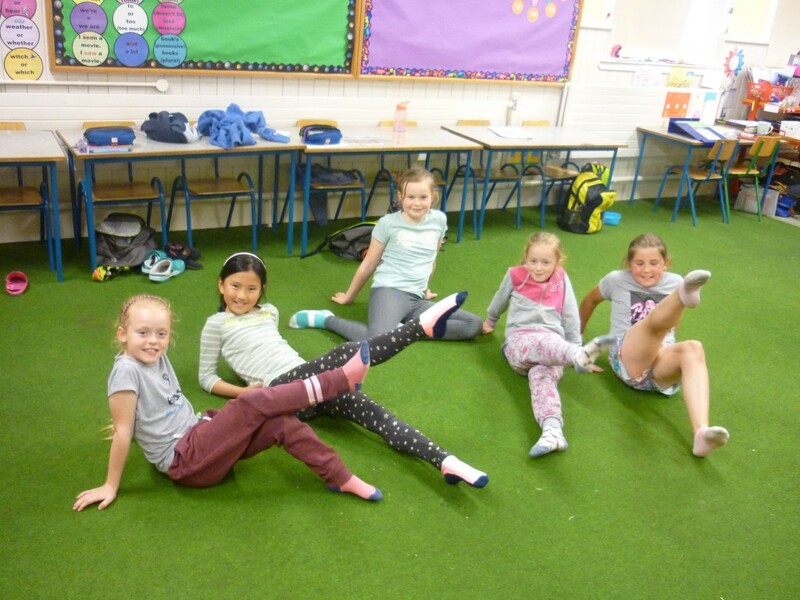 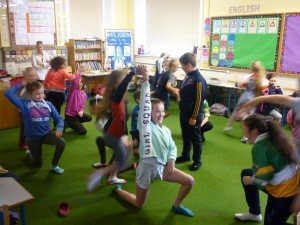 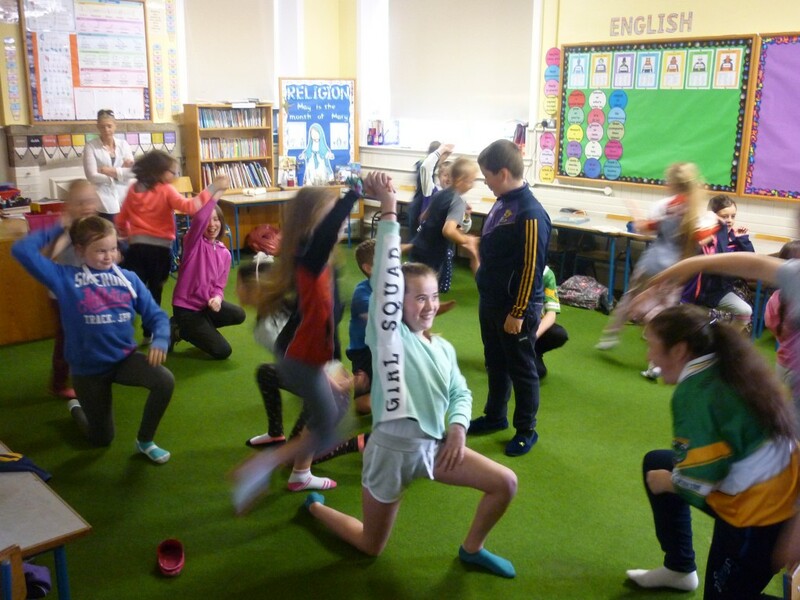 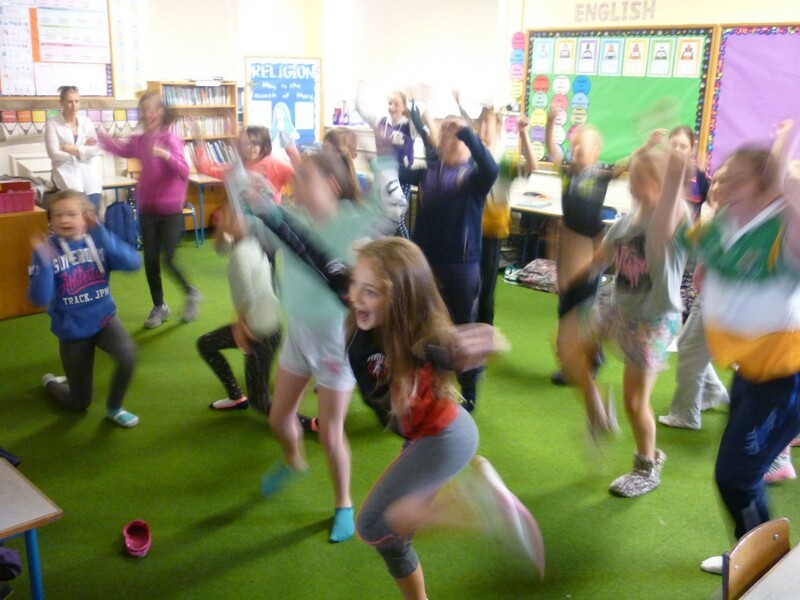 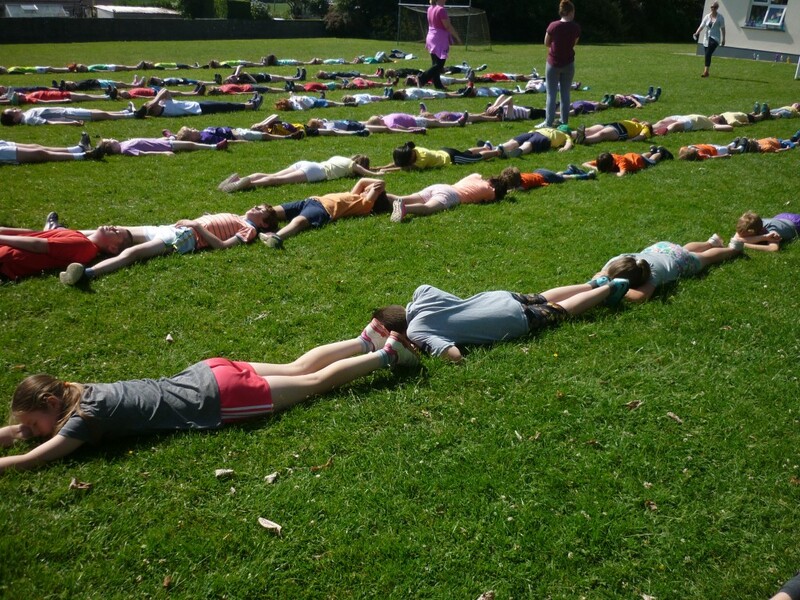 3rd-6th classes descended on Dublin for the day. First stop was Dublin Zoo. 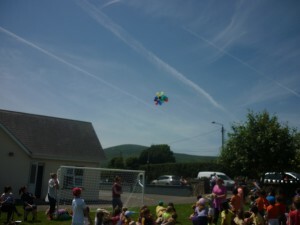 We had fabulous weather while there. 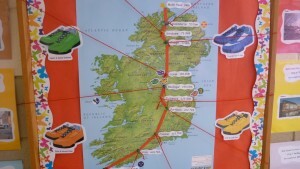 We then traveled on to Croke Park for a guided tour. 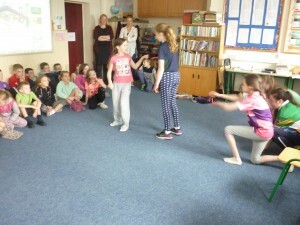 The pupils thoroughly enjoyed visiting the dressing rooms and and players lounge. 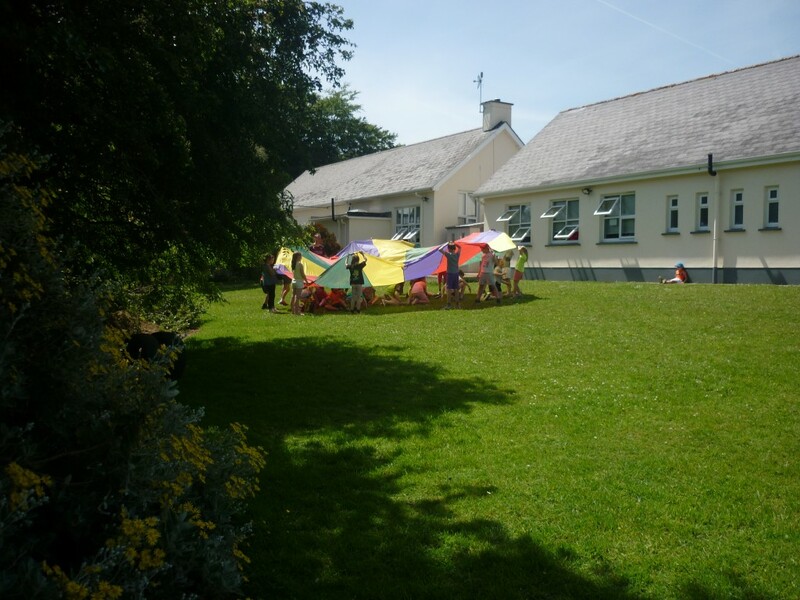 Today is our last day of Active Week and we focused on Outdoor & Adventure activities. 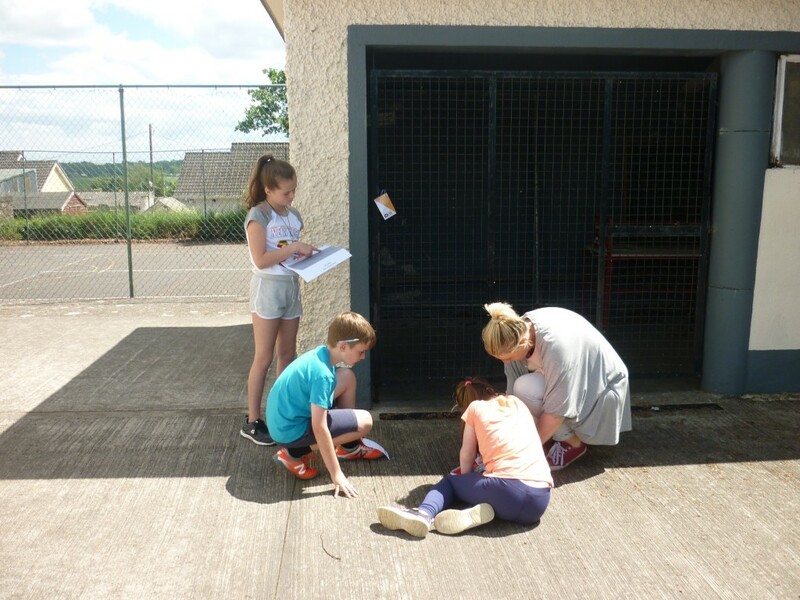 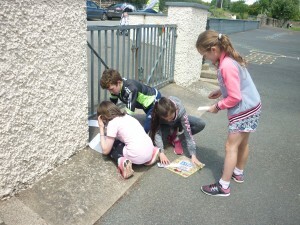 We worked in groups, reading maps and finding different tags around the school. 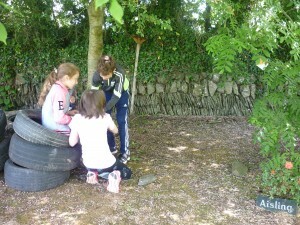 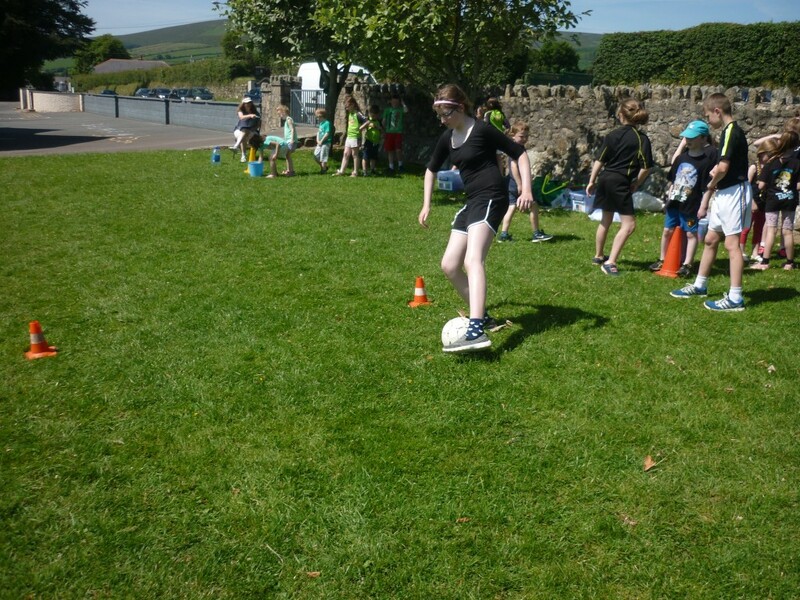 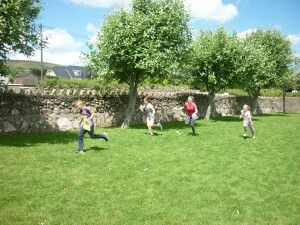 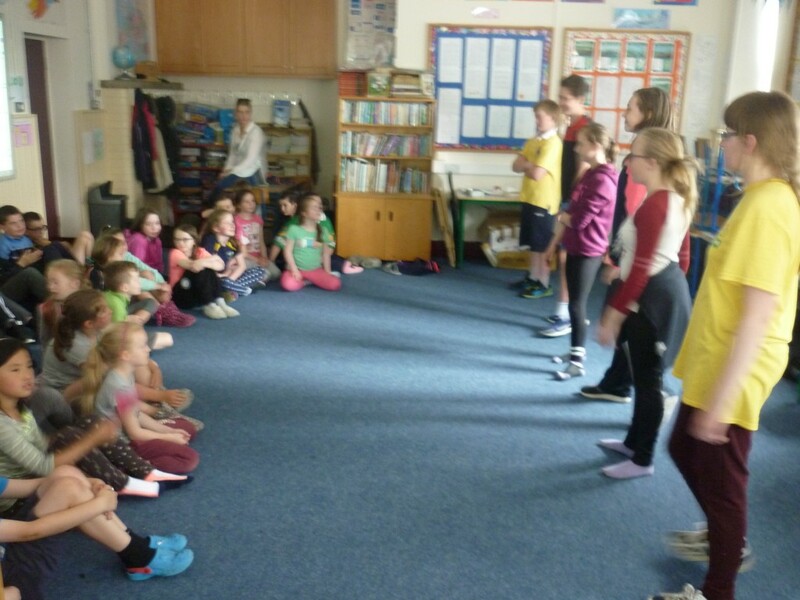 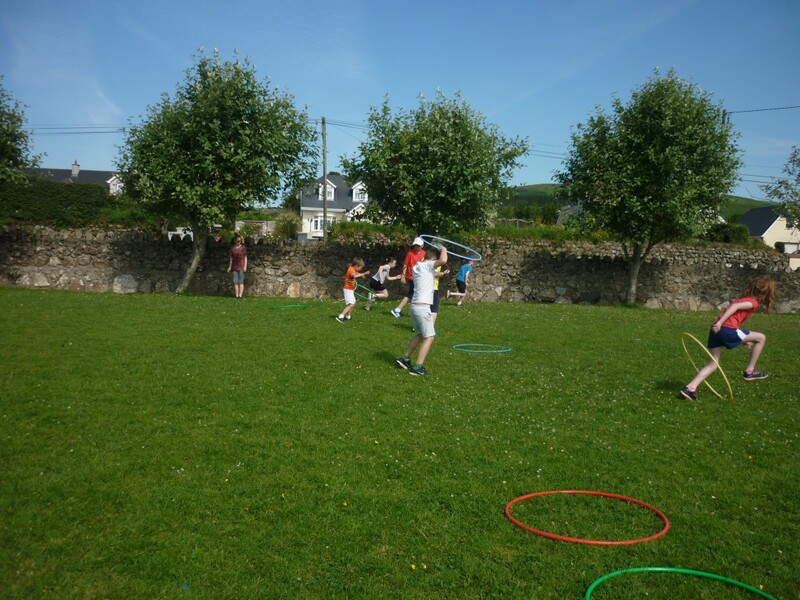 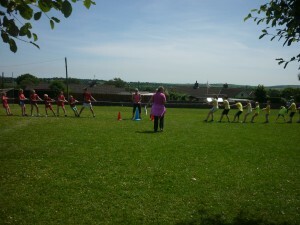 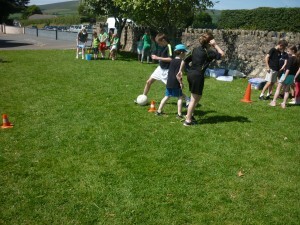 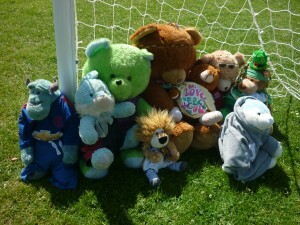 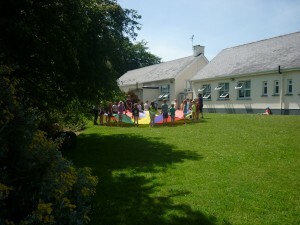 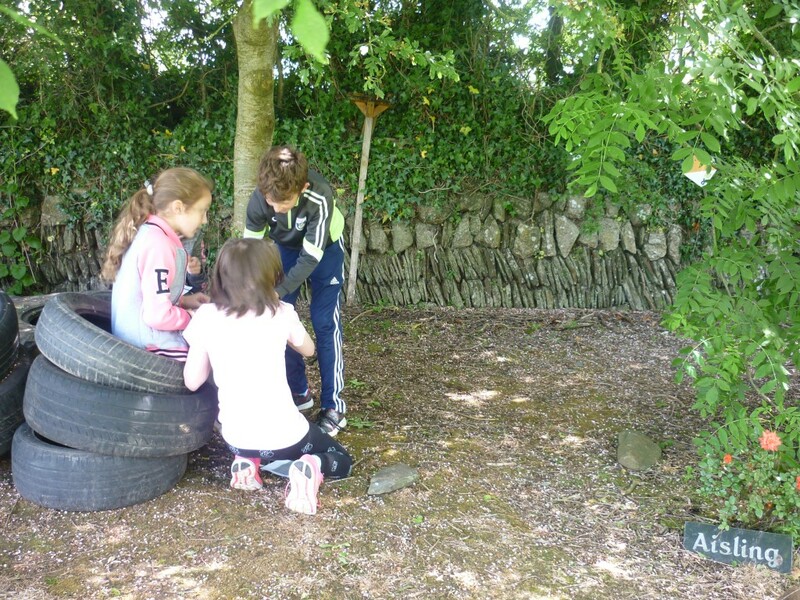 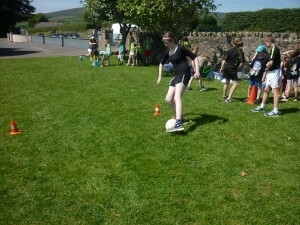 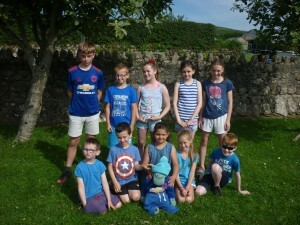 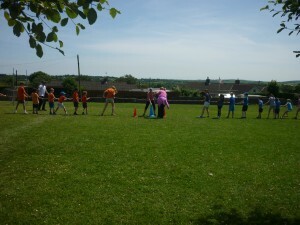 The children showed great team work and communication skills and had lots of fun along the way. 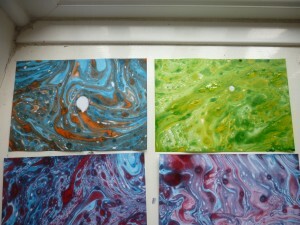 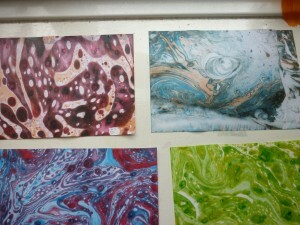 Here are some photos or our adventures! 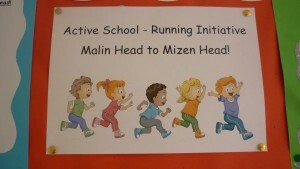 The whole school are taking part in a fun running initiative. 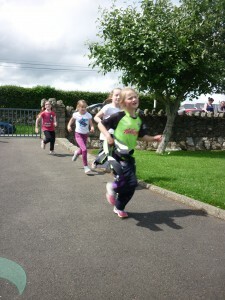 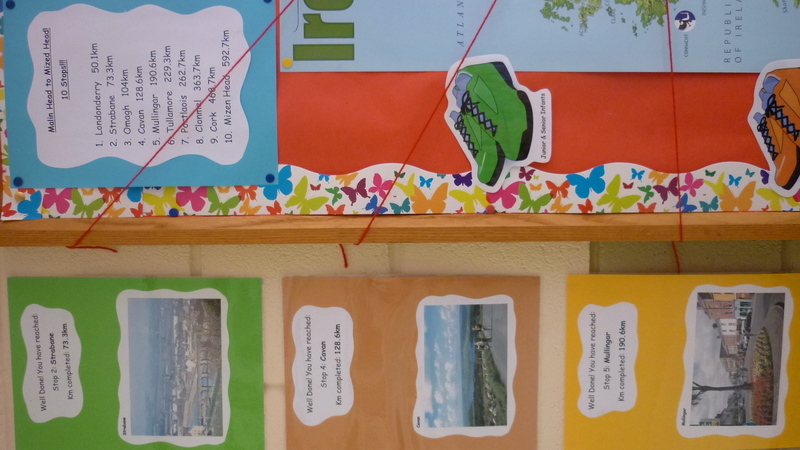 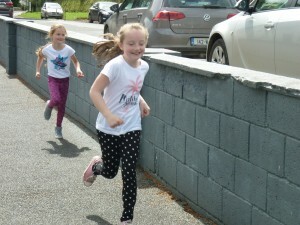 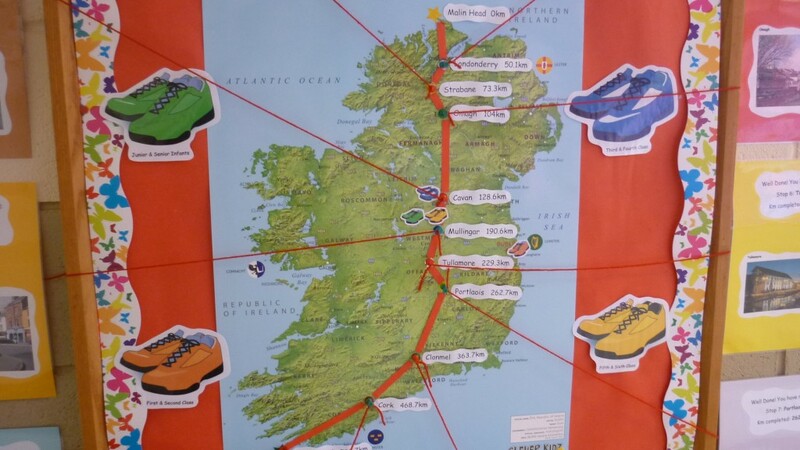 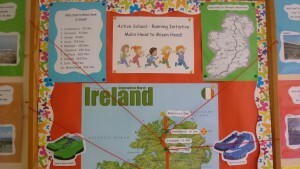 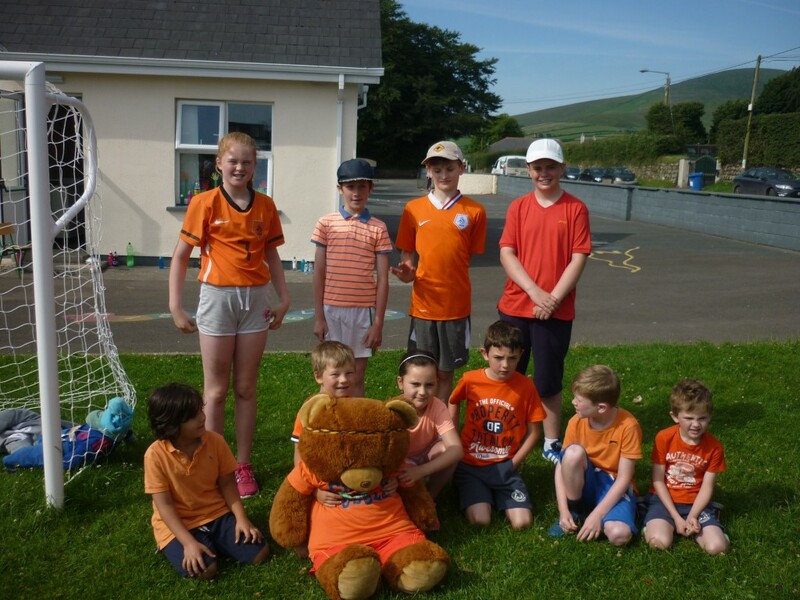 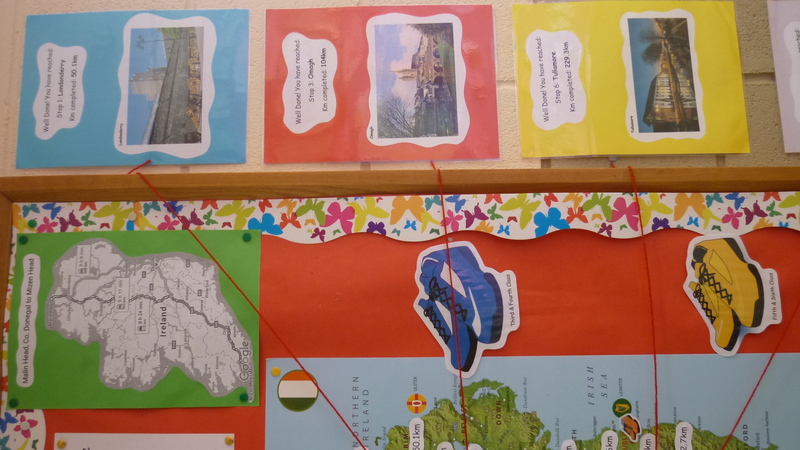 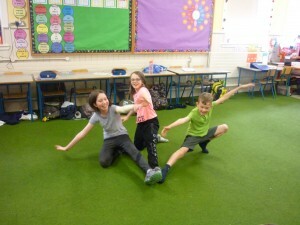 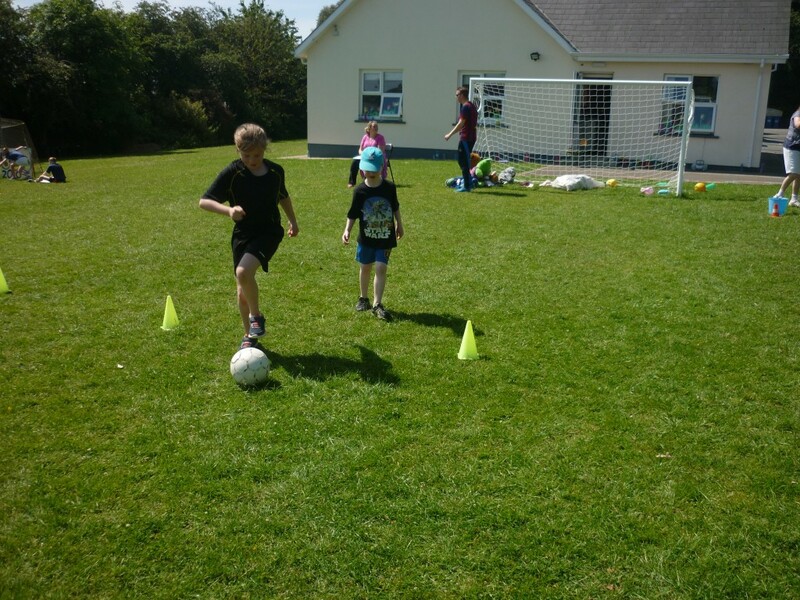 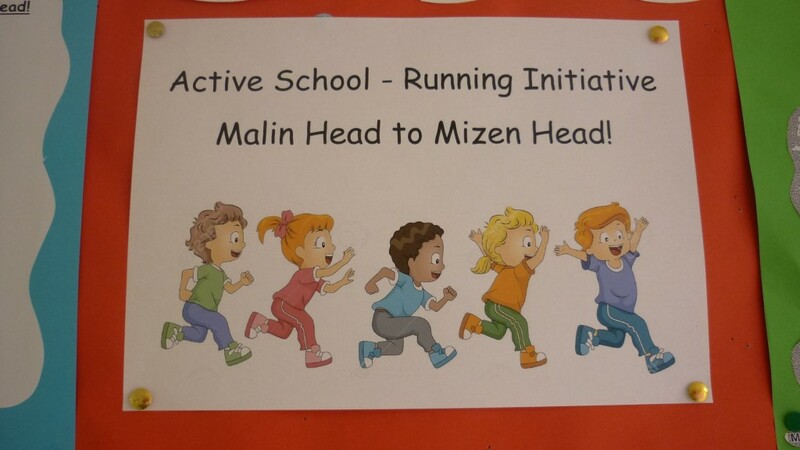 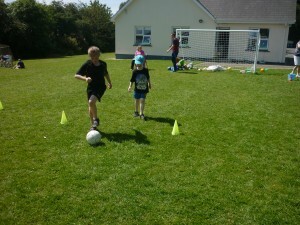 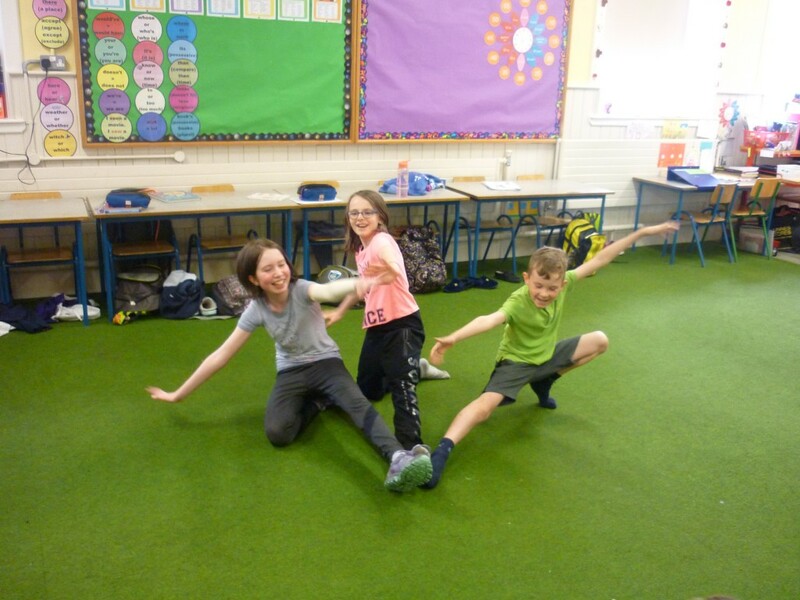 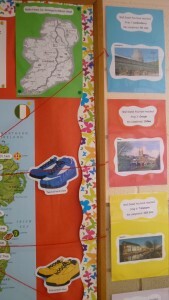 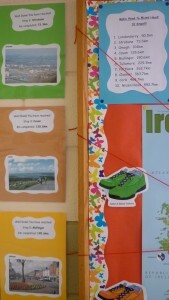 The children are running from Malin Head to Mizen Head plotting their journey along the way. 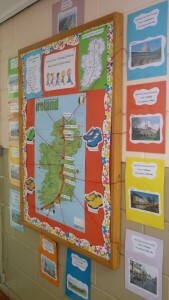 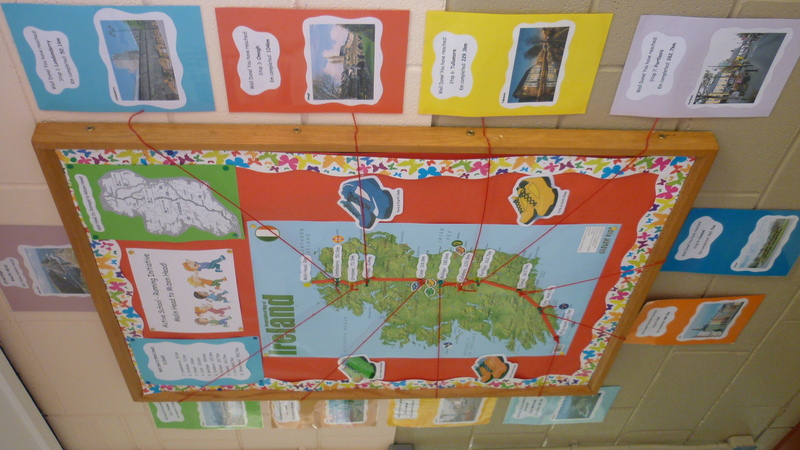 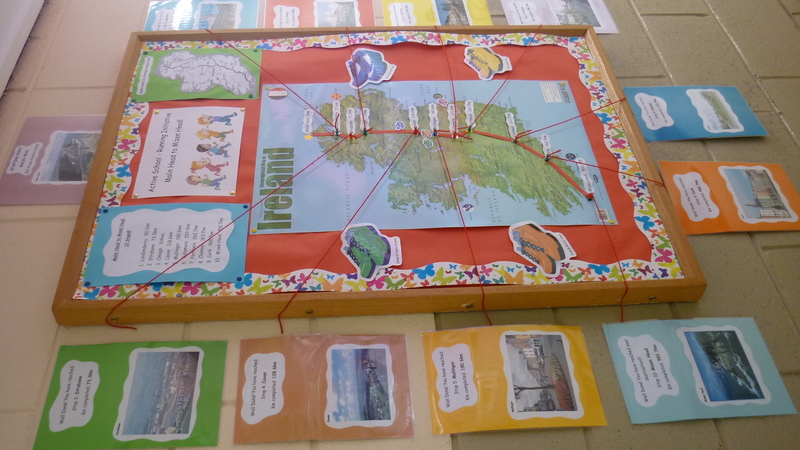 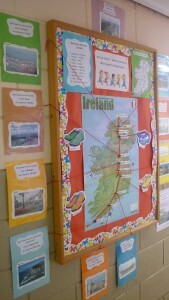 This is a whole school initiative with a fun interactive notice board to plot their journey. 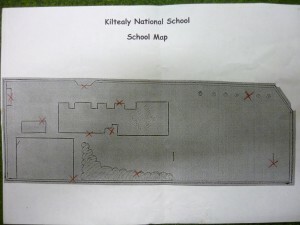 The classes enjoy pin pointing where exactly they are on the map. 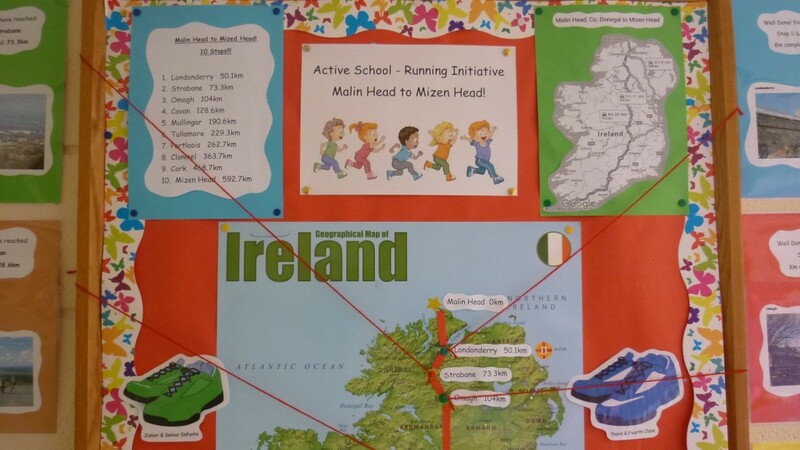 There are a number of main towns marked on the map which they have to go through before they reach their final destination, Mizen Head. The whole school love working in their class groups to get as far as they can along the route. 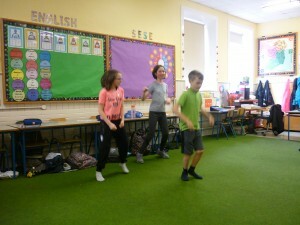 Today we focused on the Dance strand. We danced to music using the interactive whiteboard. 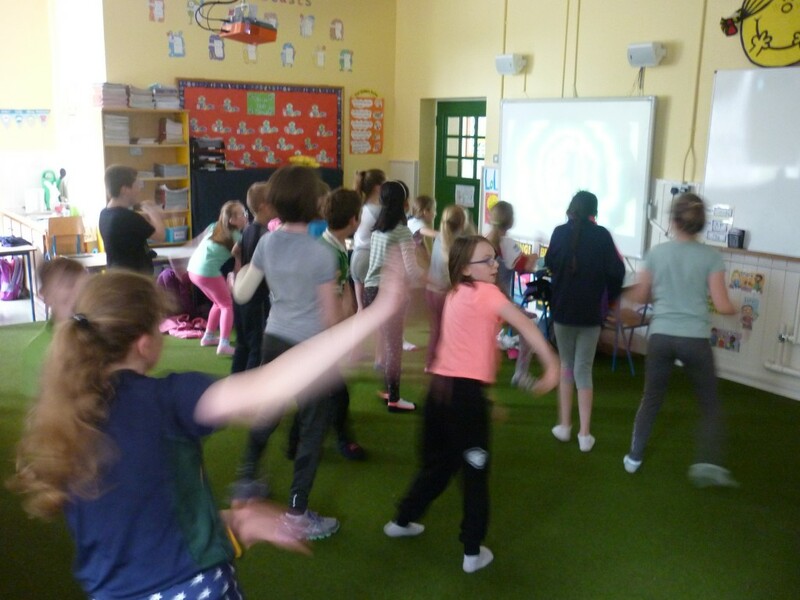 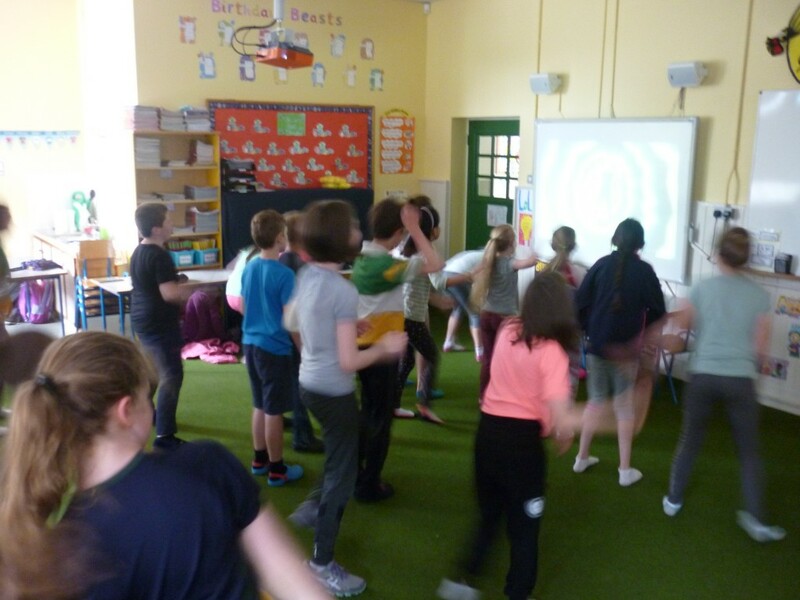 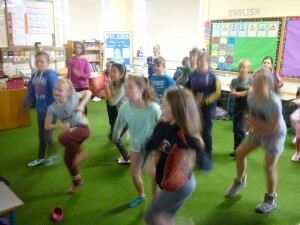 We danced along to go noodle and just dance for kids! 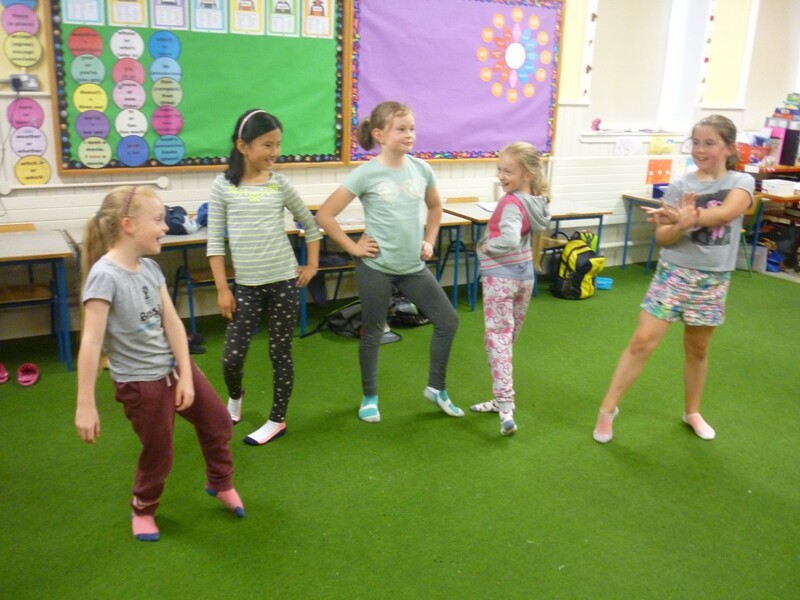 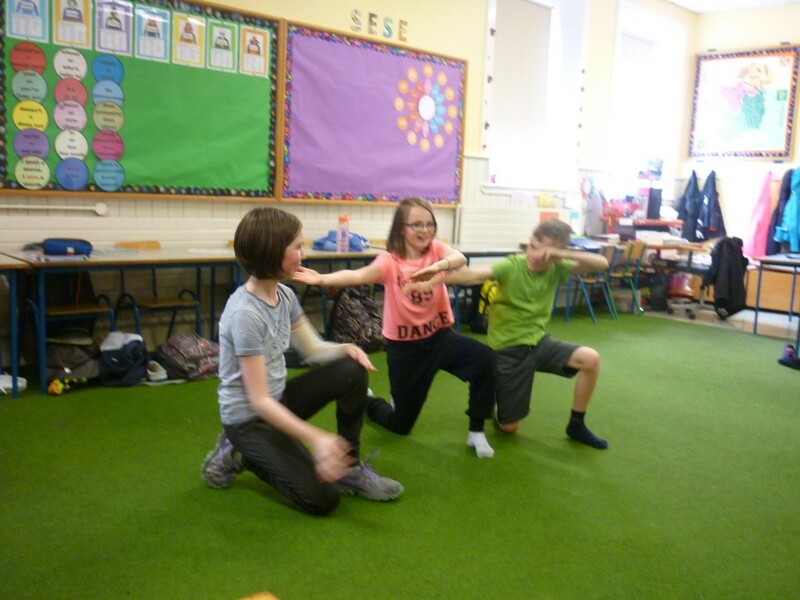 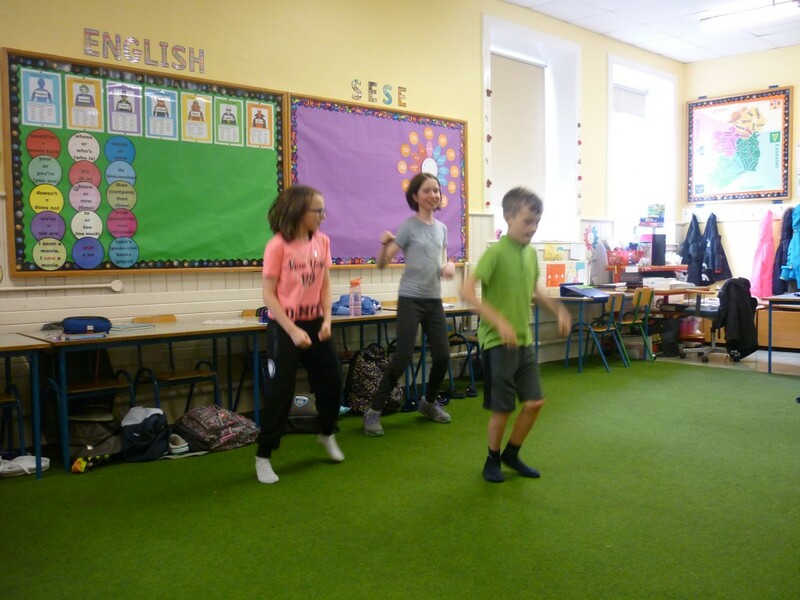 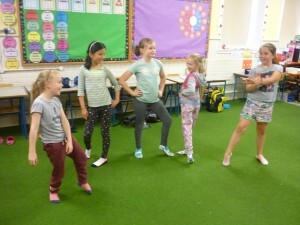 Then we made up dance moves in groups to a certain songs and performed to for other classes. It was great fun! 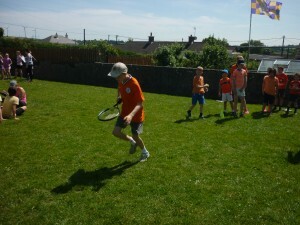 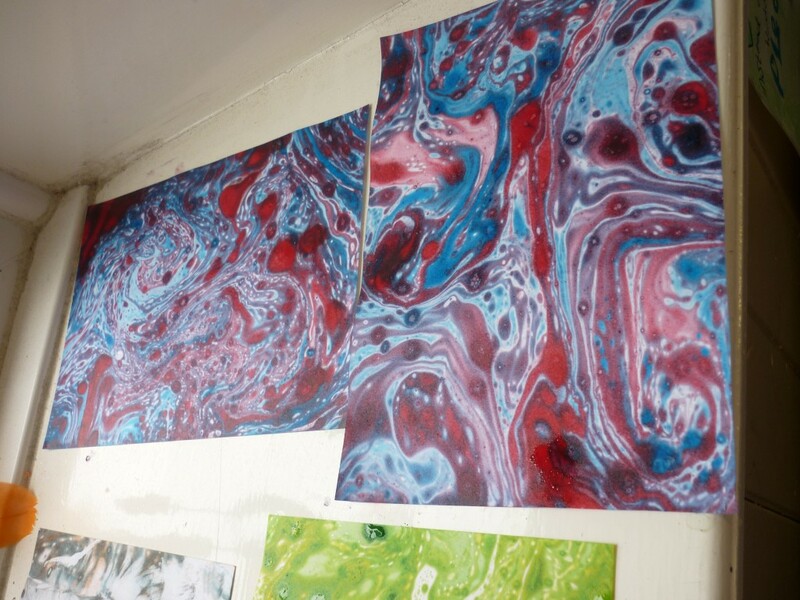 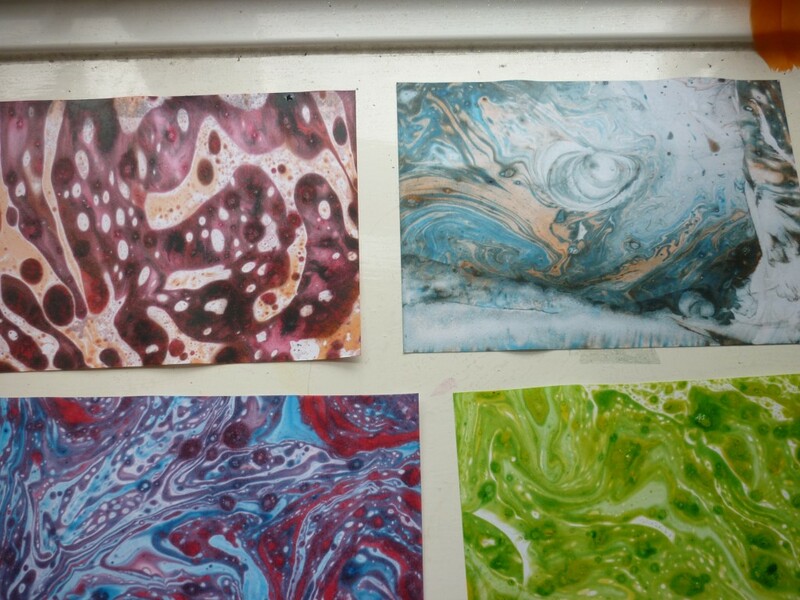 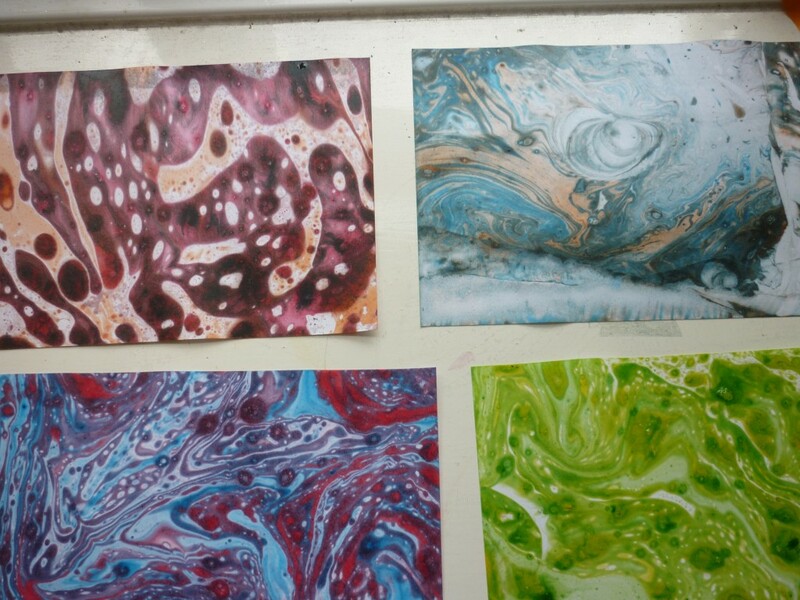 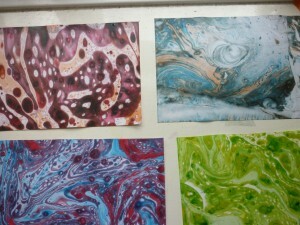 Here are some pictures of the kids in action!